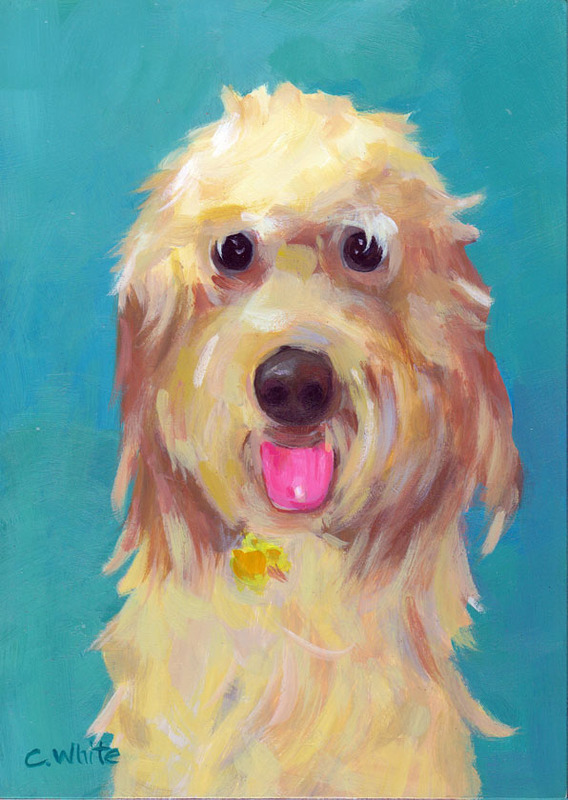 Custom paintings of the pets you love. 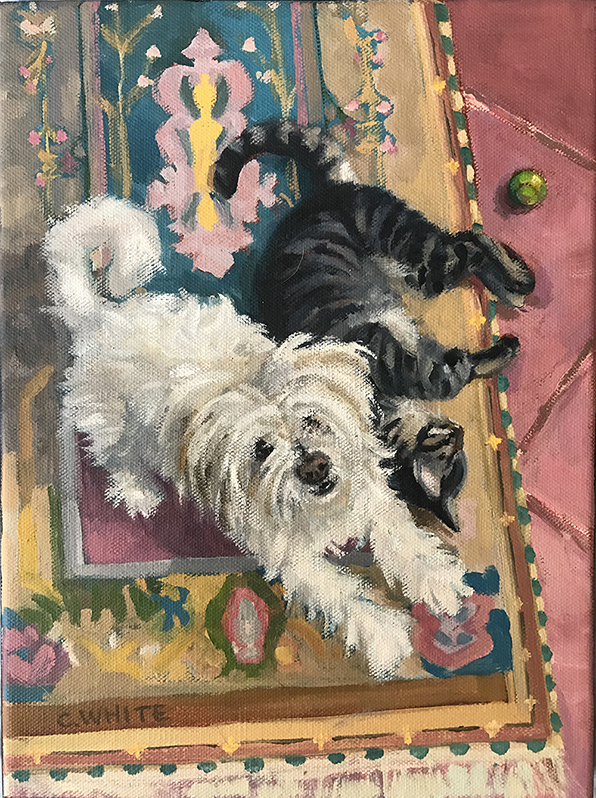 Sweetpea and Rascal, 9" x 12" oil on canvas. June, 2018. Can you even? 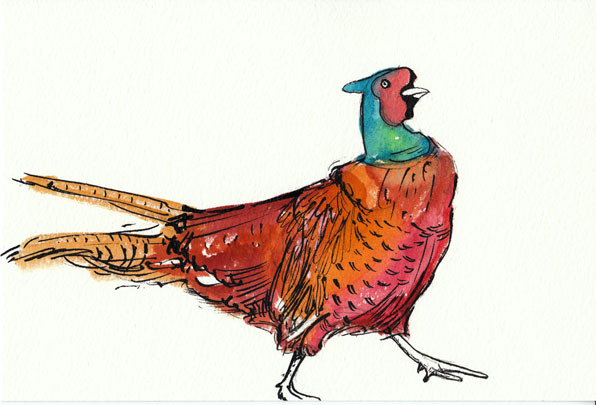 Such a joy to paint! Thank you, Veronica, Shanon and Jess. 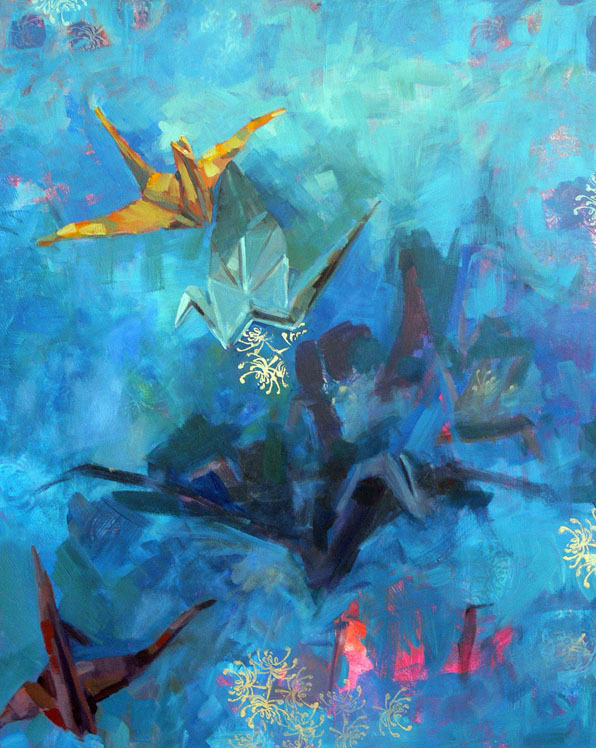 Thank you friends, family and clients for making it an awesome year of painting special memories! 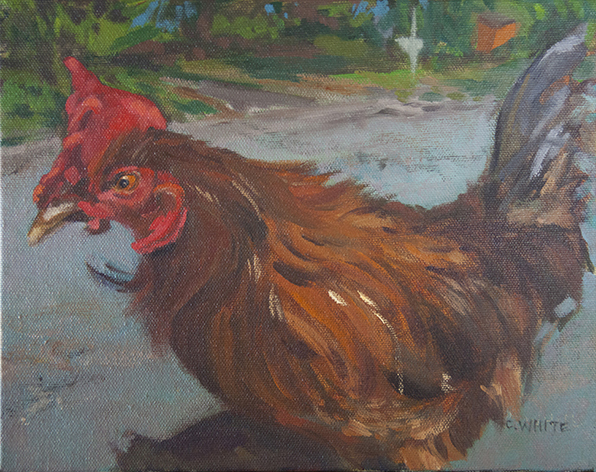 Hawaiian Rooster, 8" x 10" acrylic on canvas, December, 2016. My cousin's honeymoon was in Hawaii and he posted several photos of gorgeous roosters from the trip. 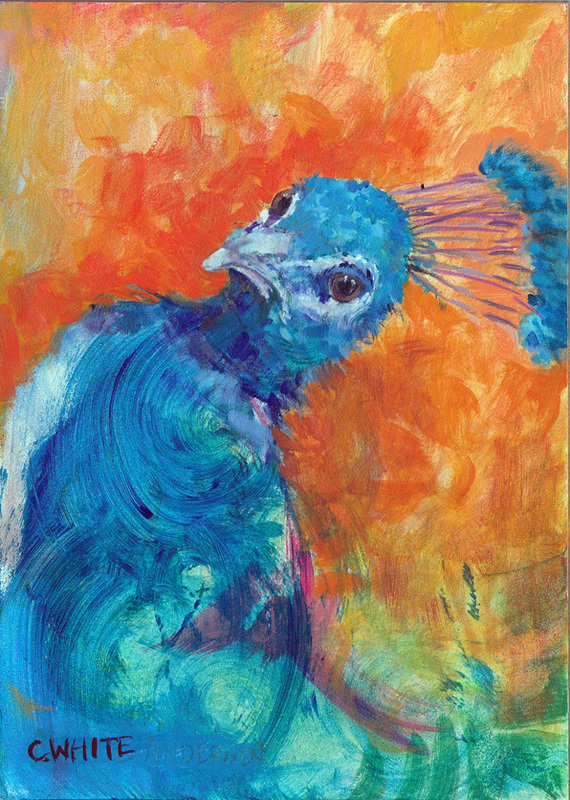 His feathers were so much fun to paint and I liked playing up all of the complementary colors. 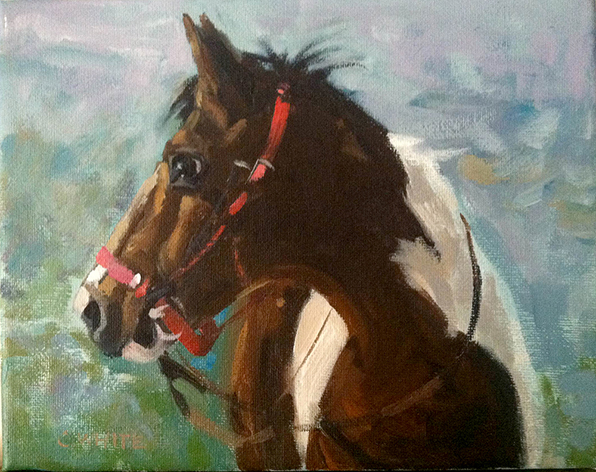 Paint the Horse, 8" x 10" acrylic on canvas, November, 2016. Paint and I met on my birthday, my very first horseback ride, a great gift from Pyar. He was the most patient and gentle friend, he even moved over from tree branches on the trail so that they would not hit me!! I absolutely love him!! Moogle, 9" x 12" acrylic on gessobord, September, 2016. 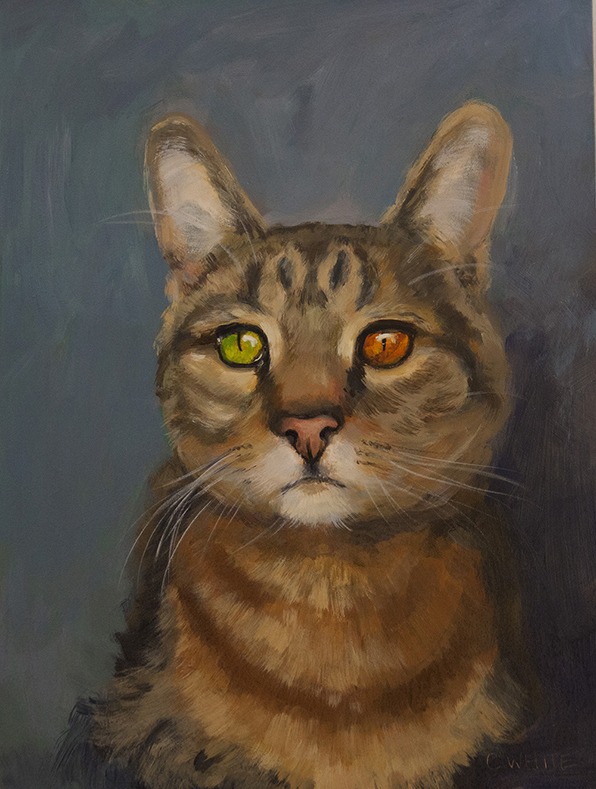 Moogle's Aunt Kika challenged me to paint her because of her eye colors and silky fur. She is regal indeed. Snelson, 10" x 10" acrylic on gessobord, May, 2016. 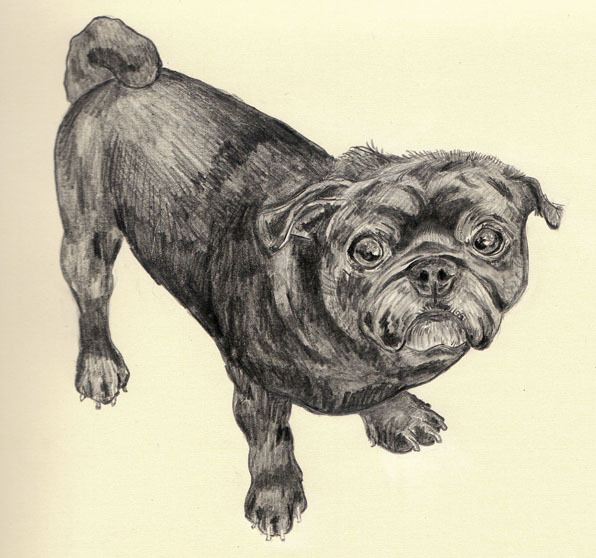 Snelson is my fairy godson who was rescued by one of my all time favorite people, Anna. Anna loves pillows and all things Snelson. I absolutely love his eyes! 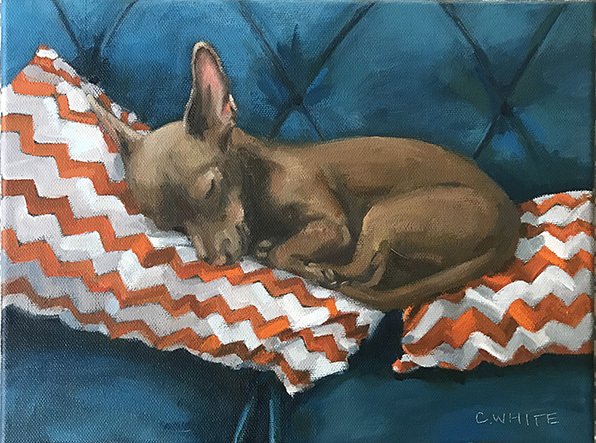 Hamilton, 11" x 14" acrylic on gessobord, April, 2016. Hamilton is my mom's new best friend! She rescued him from her local shelter after visiting with some other canines who didn't quite see her eye to eye. Once she and Hamilton laid eyes and paws on each other, that was it - love at first sight! They are inseparable, and we are so grateful for him. 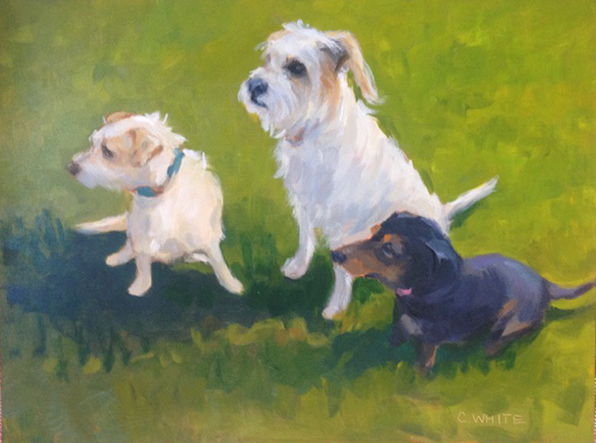 Davis, Jack and Vaya in the the Grass, 12" x 9" acrylic on gessobord, May, 2016. These three buddies are eyeing squirrels while soaking up the sun. Great friends for each other and for their people! 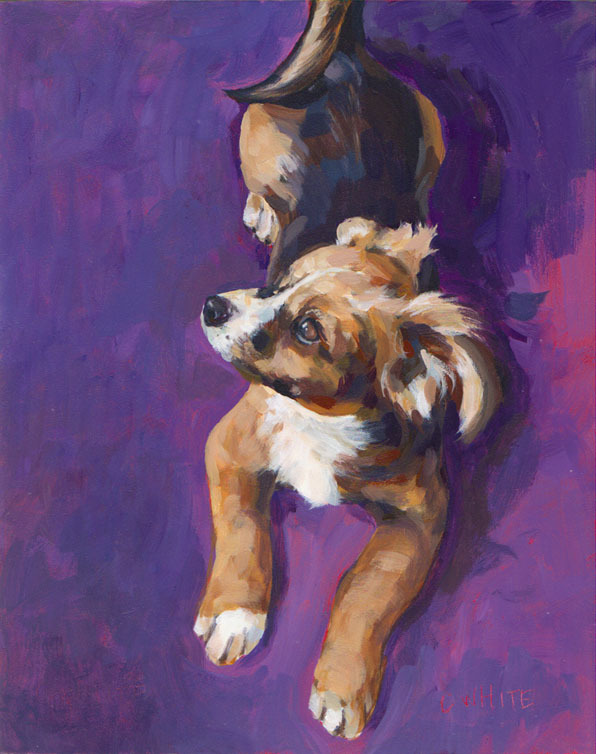 Teddy, 14" x 11" acrylic on gessobord, March, 2016. I love Teddy's long hair around his face along with his amazing sunshine eyes, what a regal boy! 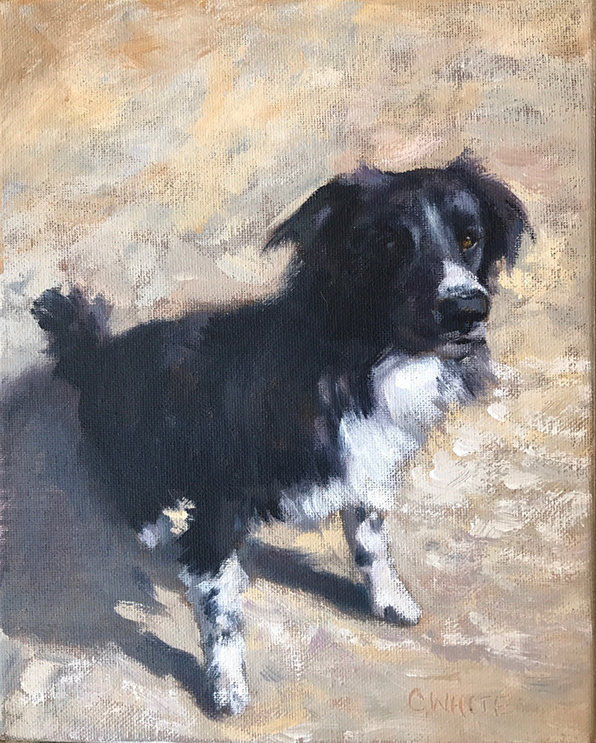 Owen, 8" x 10" oil on canvas, March, 2016. This is the very photogenic Owen, he is an adorable boy strutting his stuff! Thank you Kevin and Ali!! 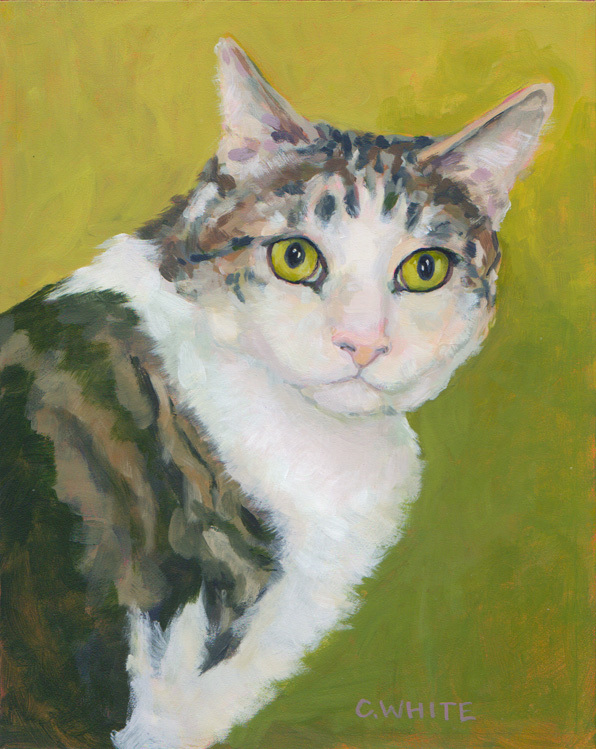 Humphrey, 16" x 16" acrylic on gessobord, April, 2016. Humphrey is a big, very sweet and funny boy! He is featured here with his favorite toy and his cute fancy paws - don't you love the ear back? This was a gift to my brother and sister in law, thanks Doug and Lori! 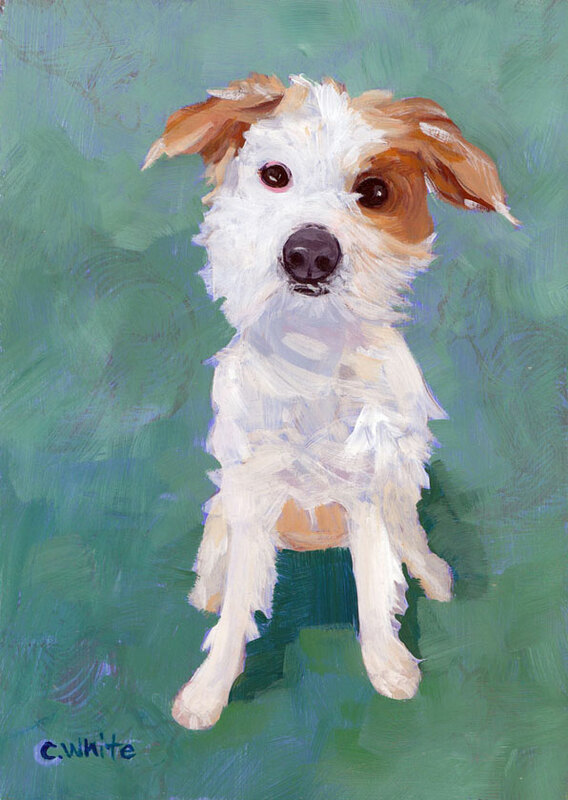 Jack, 9" x 12" acrylic on gessobord, February, 2016. Jack is our sweet lovable boy who is always available for a portrait and I can't resist his wonderful gaze. 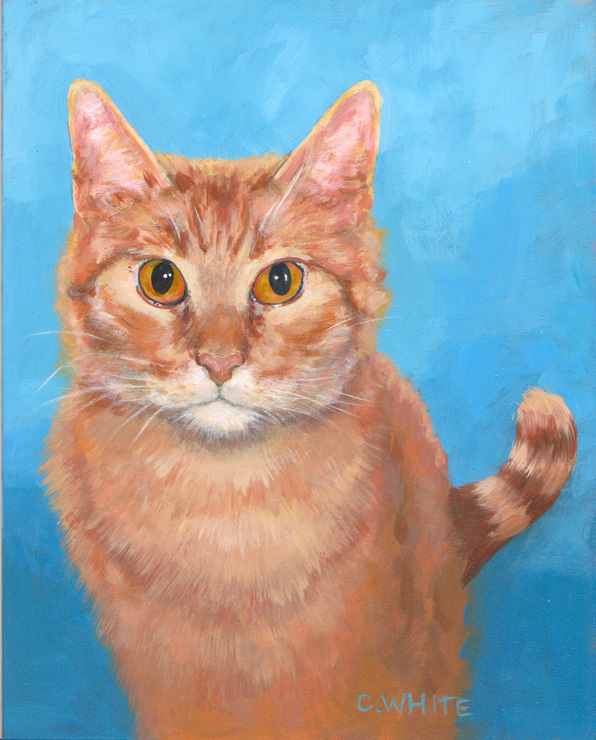 Leo, 12" x 16" acrylic on canvas, December, 2015. 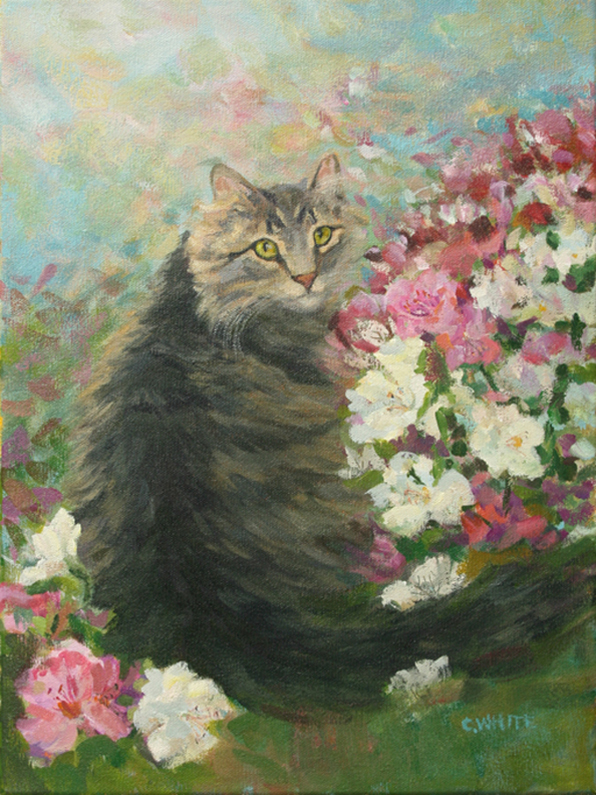 Sweet Leo is soaking up the azaleas while posing beautifully, thank you Kate T.
Nisha, 9" x 12" acrylic on canvas, December, 2015. Nisha has her work cut out for her with this pose, what a sweet girl! 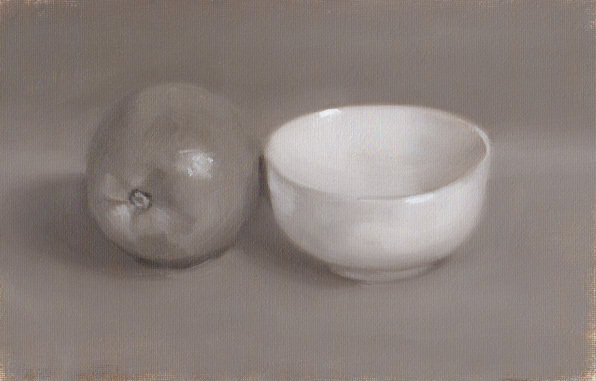 Yin and Yang, 9" x 12" acrylic on canvas, December, 2015. Yin and Yang are a hilarious duo of miniature yorkies that we had the chance to babysit. 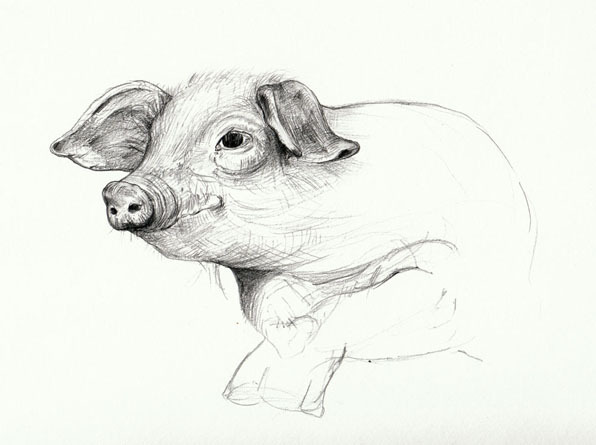 They are such hams for the camera and wonderful models while I sketched. 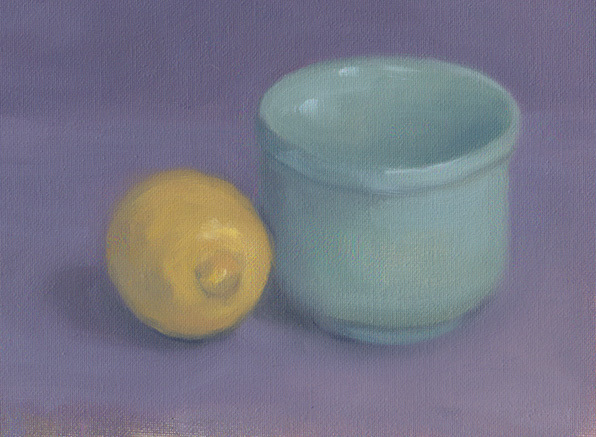 Violet and Marigold, 8" x 10" acrylic on canvas, November, 2015. 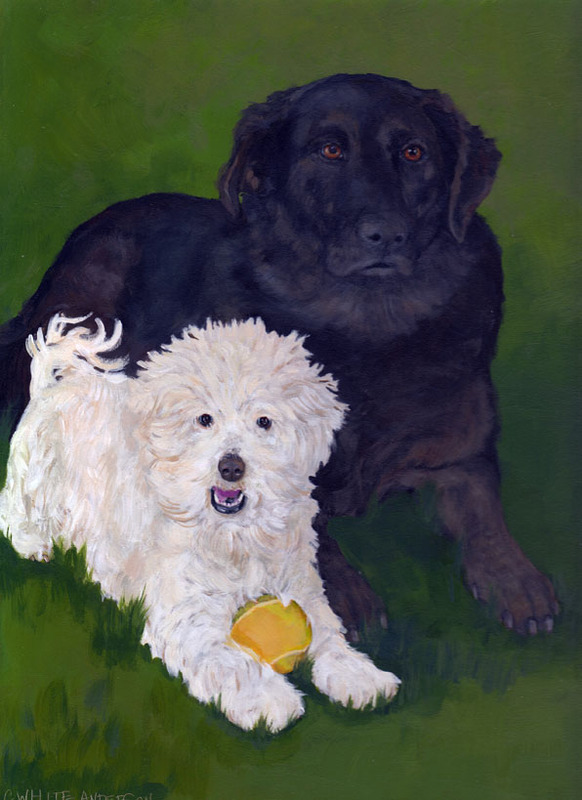 This is the lovely duo that I have painted individually before on commission. I had additional photos and could not resist painting this sweet pose in a kind of Monet style. 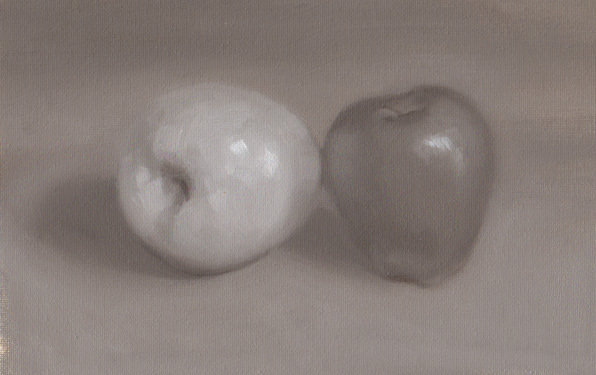 Juliet, 9" x 12" acrylic on gessobord, October, 2015. The lovely Juliet if from the famous duo, "Hank and Juliet", all grown up! 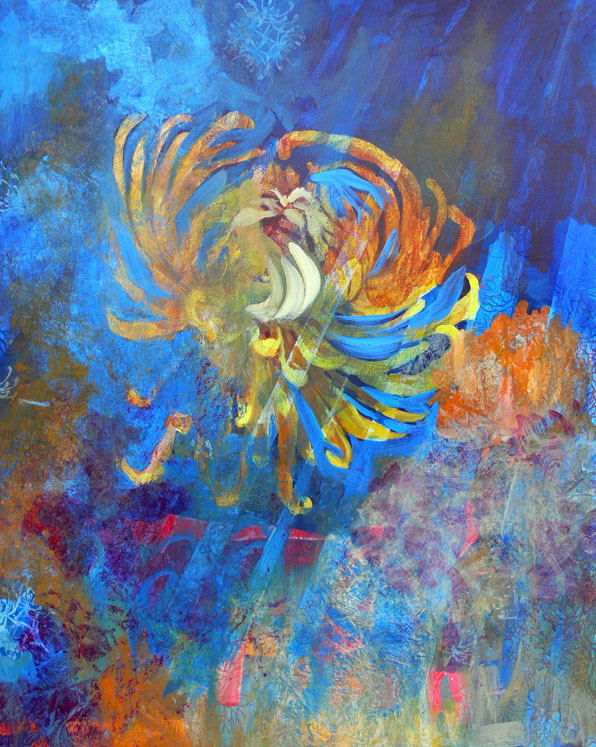 I had fun playing with the complements of blue and orange in this lively work. Thank you AC! 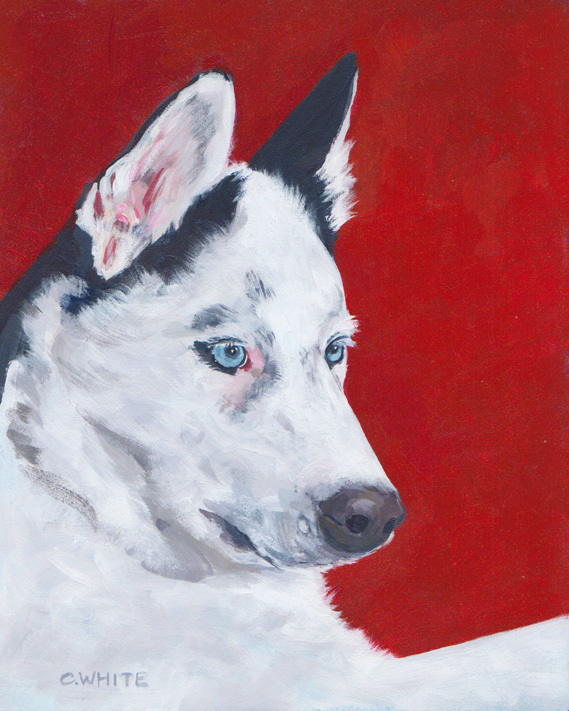 Sharky, 9" x 12" acrylic on canvas, October, 2015. Sharky is our friend who used to be our neighbor. 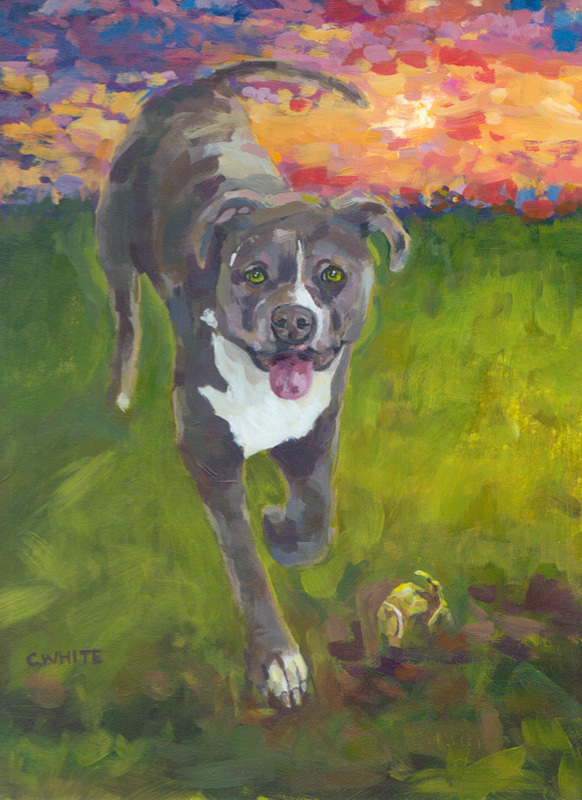 He has a heart of gold and is a remarkable example of the true nature of pit bulls - gentle, fun loving and sweet. 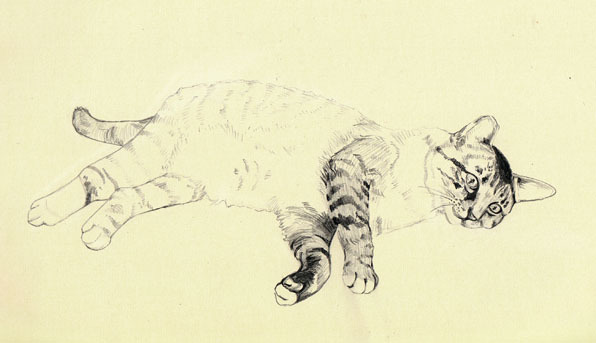 Thank you Cat! 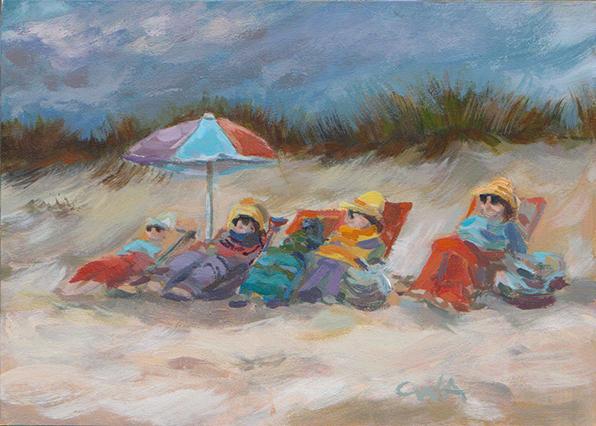 Dallas, 8" x 10" acrylic on canvas, August, 2015. Dallas is our friend who used to be our neighbor. She is a doll baby and her sweet face says it all! Thank you Brian, Jill and Dallas. Lily, 9" x 12" acrylic on gessobord, March, 2015. Oh Lily! She is so regal on her sofa, I had a blast capturing her expression and fur. A special gift for a wonderful couple, thank you Heather. 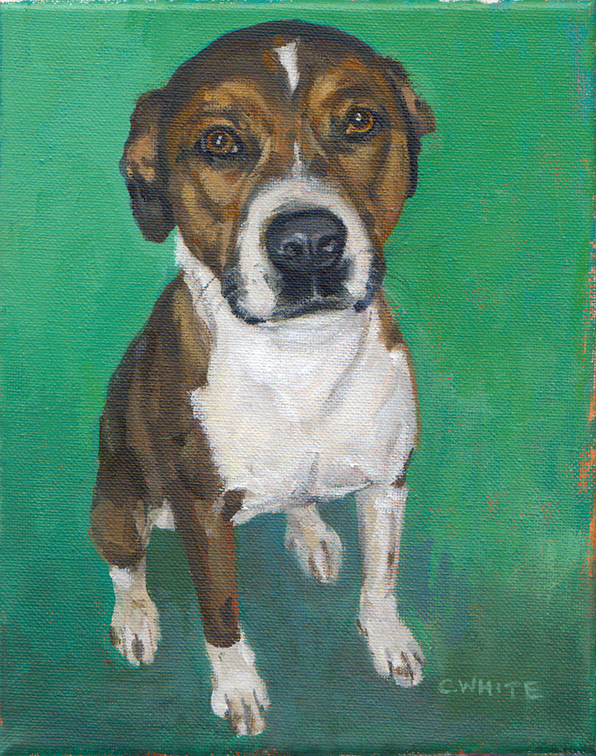 Max, 8" x 10" acrylic on gessobord, February, 2015. Max is squishing his face between friends' arms to get a glimpse at what is going on! 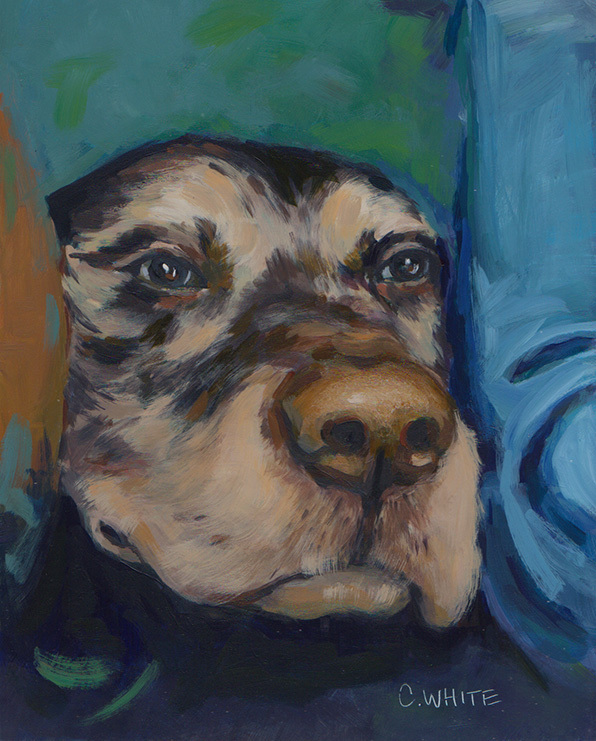 He was a very beloved dog and I am honored to have the opportunity to capture his sweet face. Sweet Peter Pan, 8" x 10" acrylic on gessobord, January, 2015. 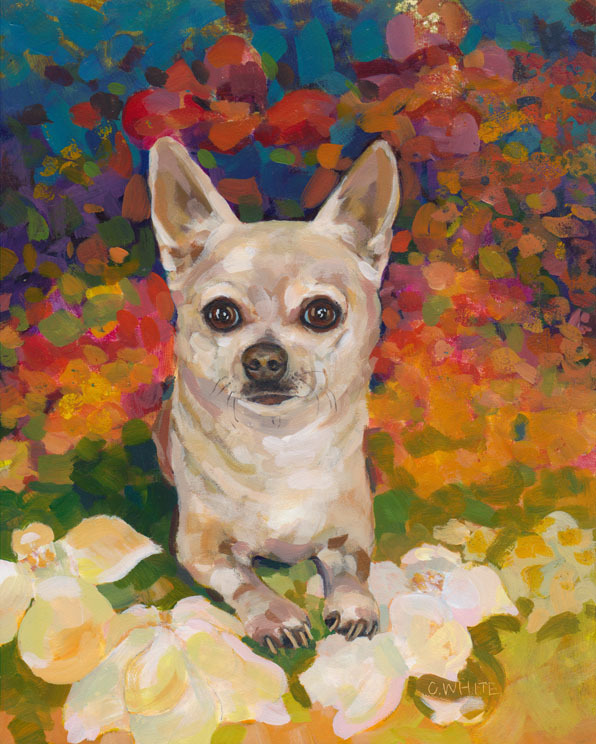 Peter Pan is a sweet little boy playing in his mom's favorite color, rainbow! 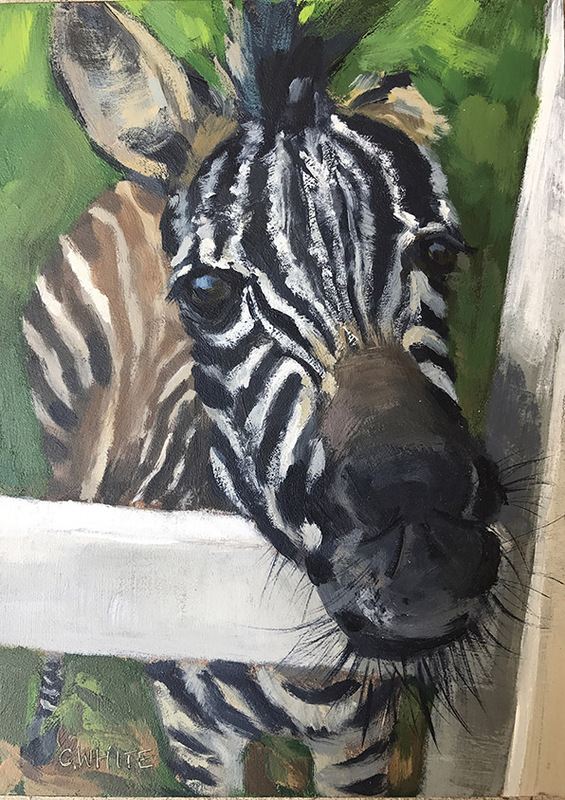 I am thrilled to share that when my dear friend, Peter's mom and fellow teacher/artist, Amanda saw the painting, she squealed and exclaimed, "Awww! There is so much life, I want to cuddle with him! . . . I have no words." That truly is one of the best compliments, ever, I am so grateful!! 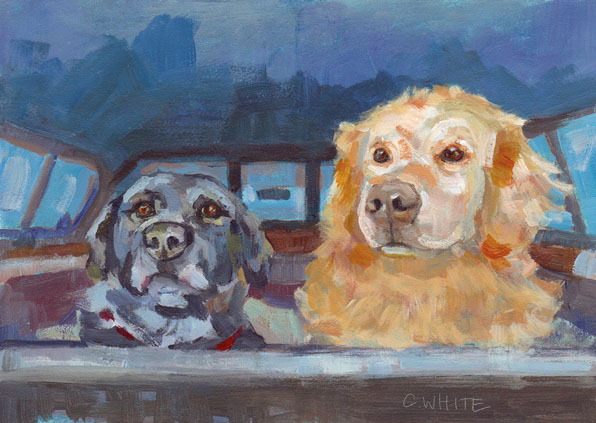 Hank and Juliet, 11" x 14" acrylic on gessobord, December, 2014. From the very moment AC sent me this picture, I fell in love. Hank is sweetly spooning baby Juliet while she snoozes. I thoroughly enjoyed capturing this moment. 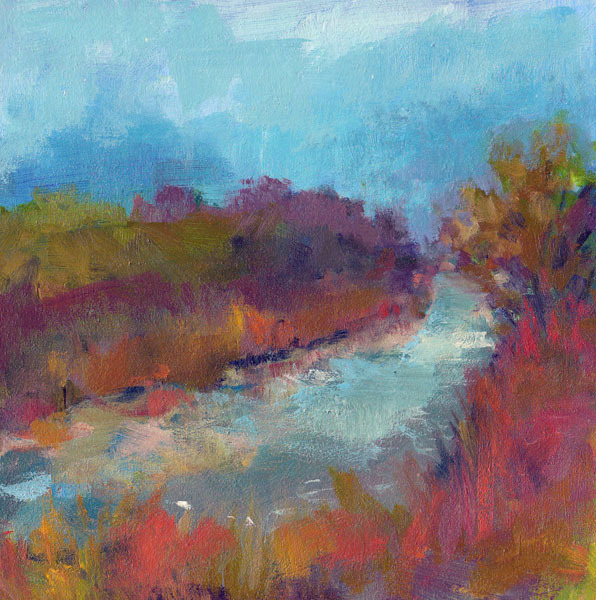 Charley, 5" x 7" acrylic on gessobord, November, 2014. This sweet girl loves her mom's alma mater! 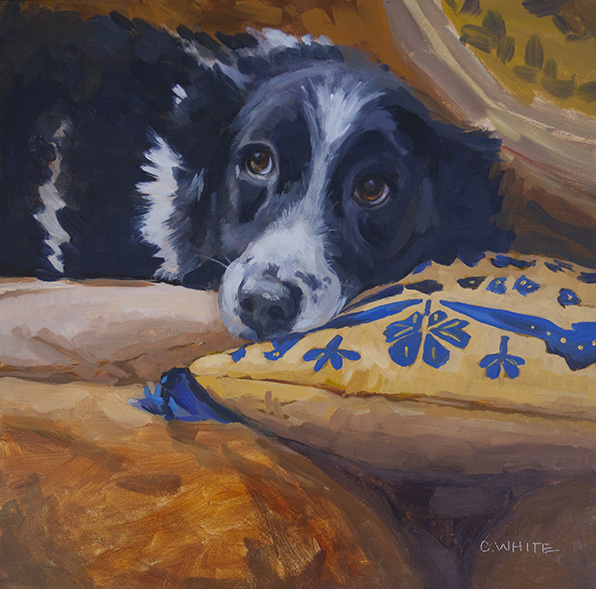 The painting is a surprise gift and features Charley's mom's favorite colors. 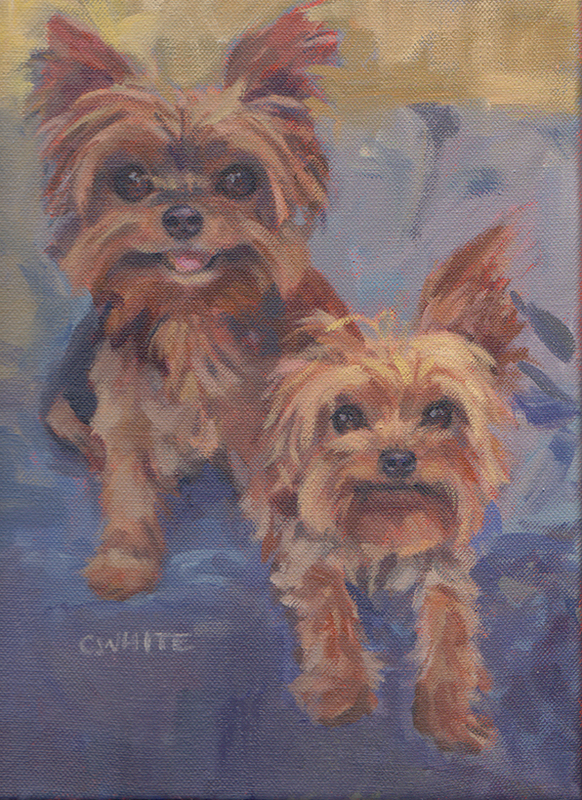 Lola and Lilo, 8" x 10" acrylic on gessobord, November, 2014. Besties on a Boat! 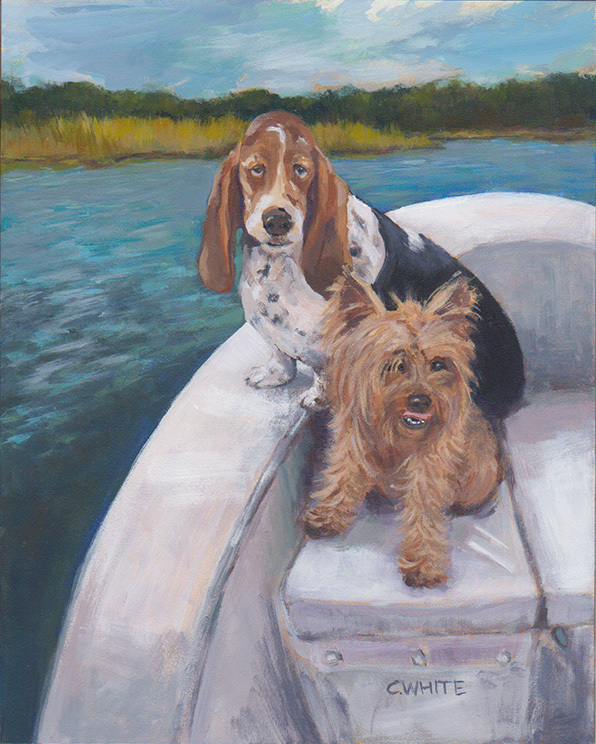 These sweet pups live the good life in Savannah, Georgia. 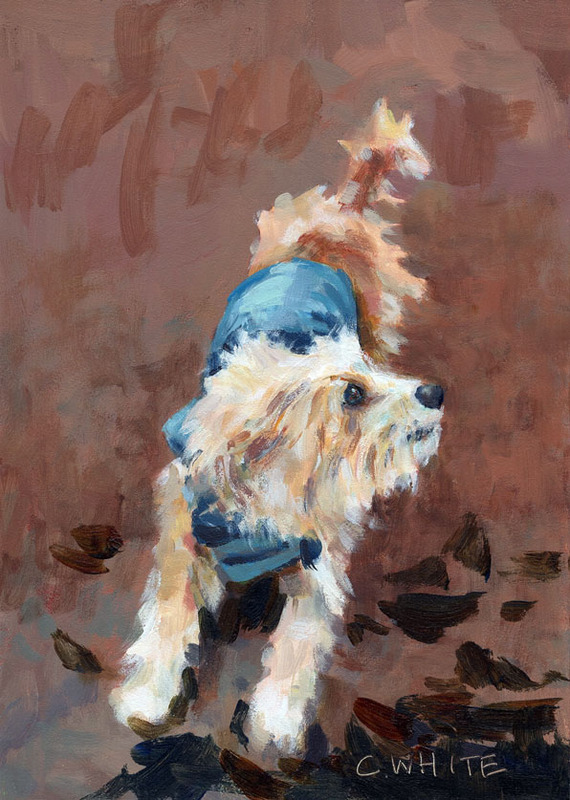 Jack, 9" x 12" acrylic on gessobord, October, 2014. Sweet Jack passed when he was only two years old. I am honored to have the opportunity to know him through his portrait. 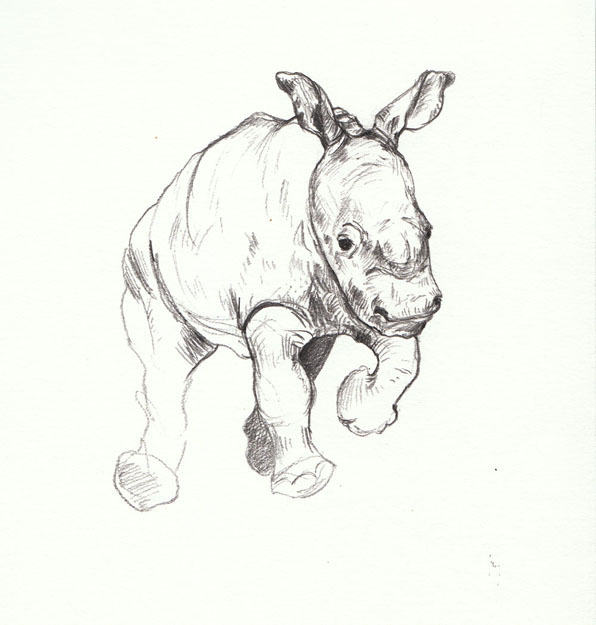 His parents love him dearly and remember him fondly, running in the grass playing with his favorite toy. 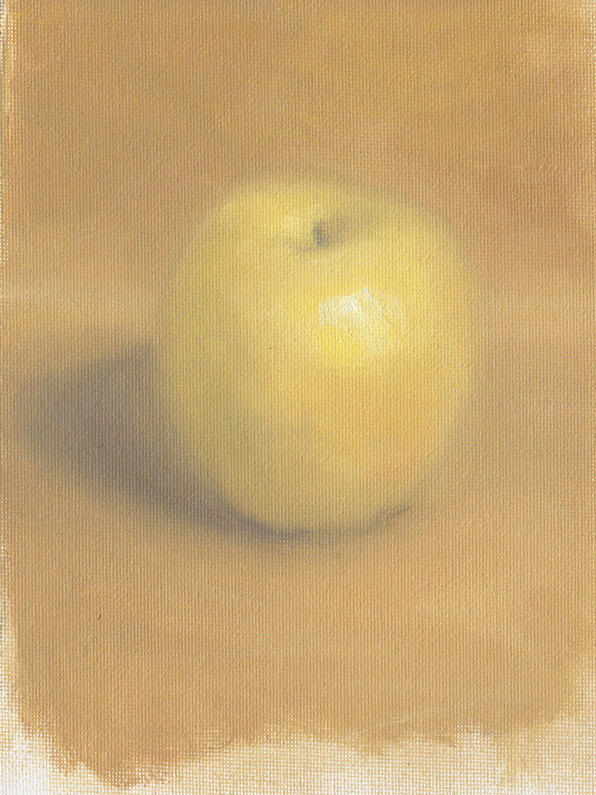 Simon, 8" x 10" acrylic on gessobord, October, 2014. 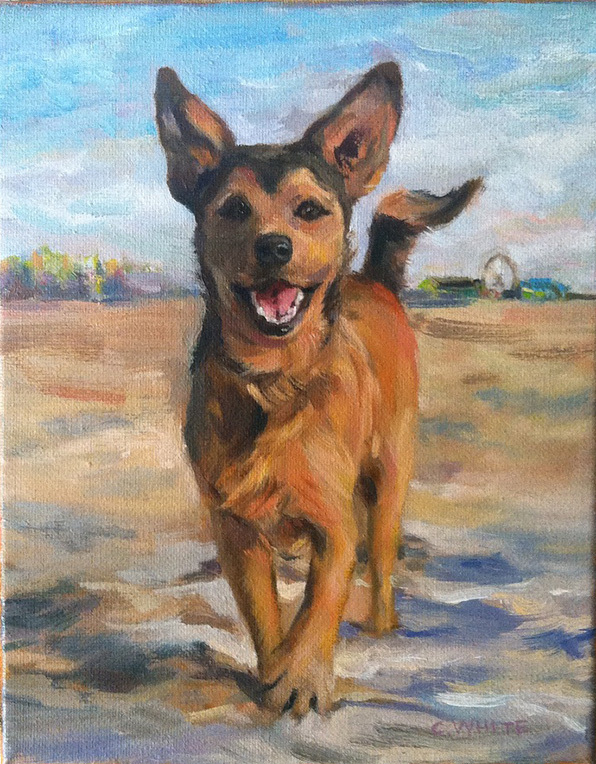 My furry cousin, Simon was a delight to paint. I absolutely love seeing the nuances in white fur. He is such an angel. 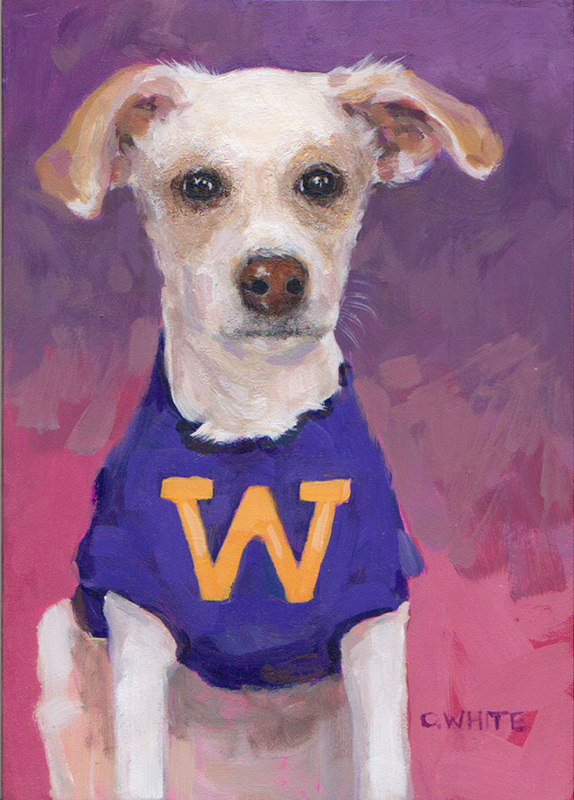 Violet, 8" x 10" acrylic on gessobord, September, 2014. Violet is elegant and lovely. 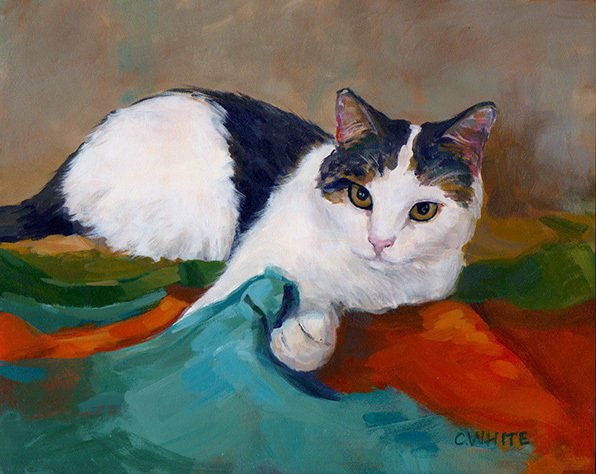 She is one of two cats that share a wonderful life with Vicki of Los Angeles, one of my favorite teachers. 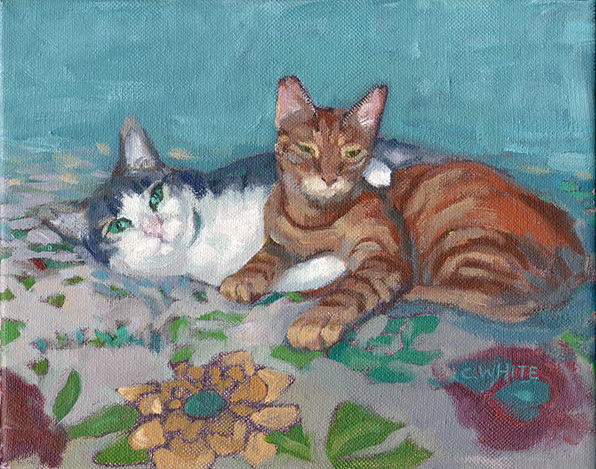 I feel very lucky to have the opportunity to paint such sweet cats as Violet and Marigold. 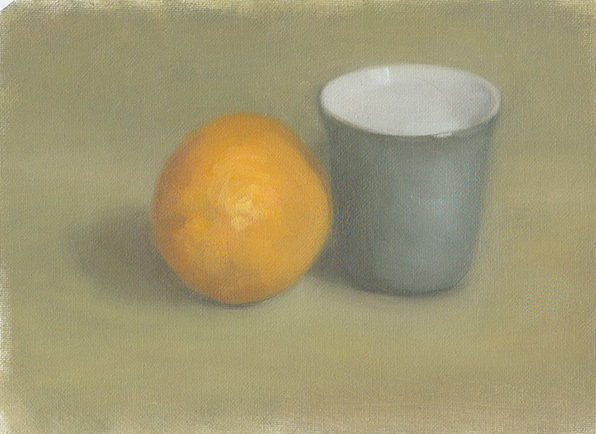 Marigold, 8" x 10" acrylic on gessobord, September, 2014. Marigold is one of those sweet boys that is both regal and cute! He was an excellent model too! 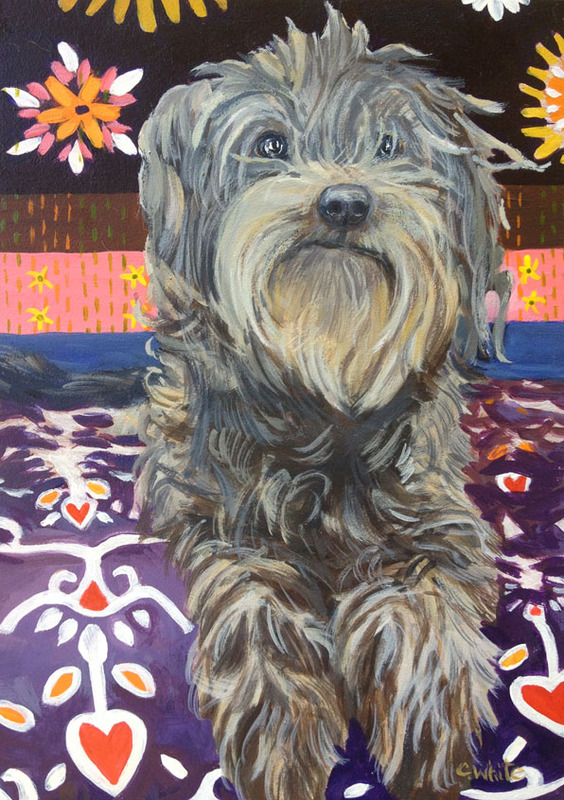 Maeby, 11" x 14" acrylic on gessobord, August, 2014. 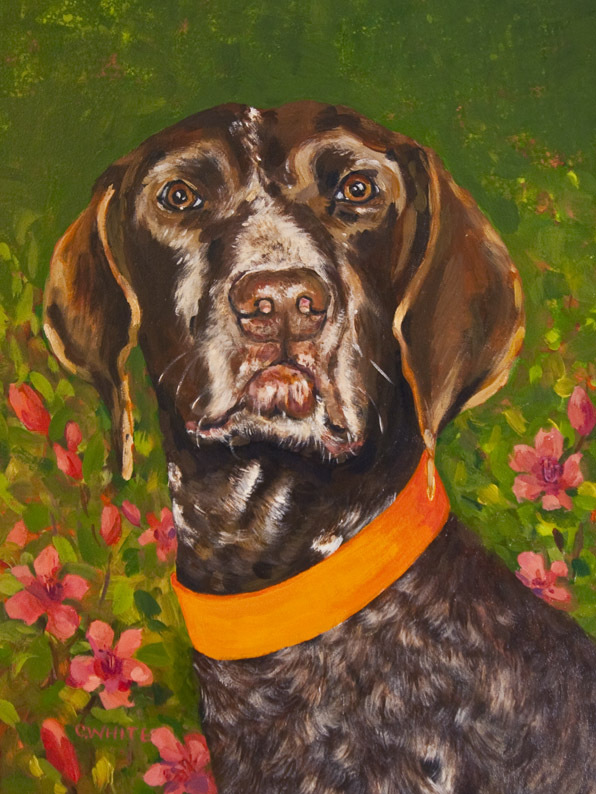 Maeby is featured among her family's favorite salmon colored azaleas in Savannah, GA. She was an elegant and tolerant pup who was loved dearly by anyone she met. 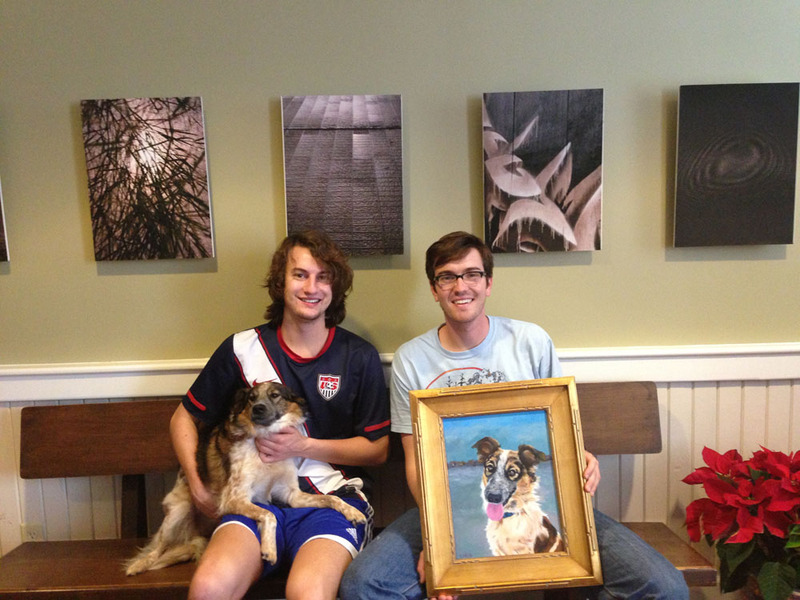 Thank you Devin and Sarah for the opportunity to paint your sweet girl! 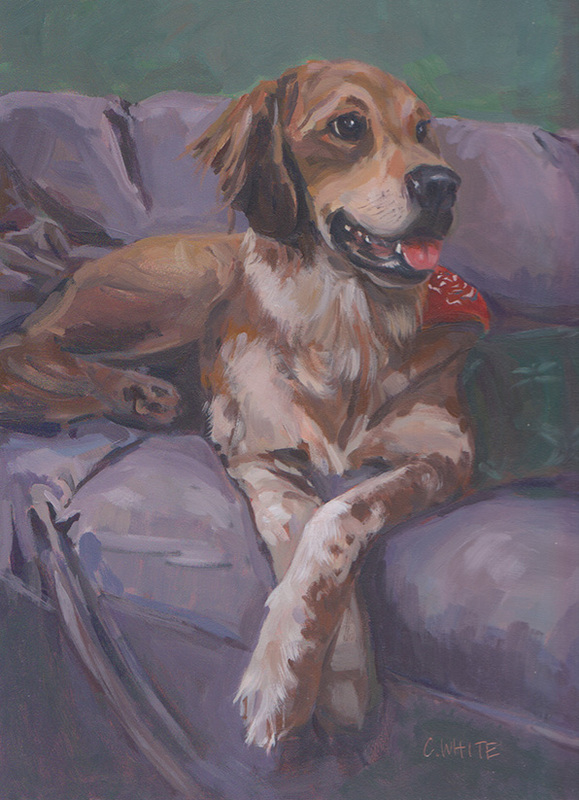 Ruby, 8" x 10" acrylic on gessobord, August, 2014. Sweet "B" is the best friend of our hero, Heather. Heather adopted B when she needed a new loving, forever home. 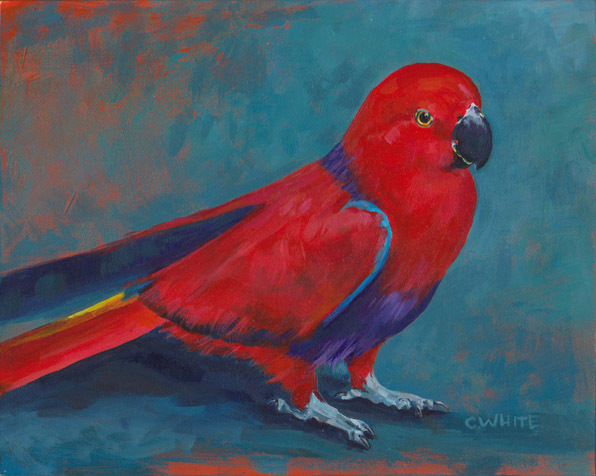 I am so thrilled to have had the opportunity to capture Ruby in a portrait, she is my first feathered portrait! Our sweet friend Heather is Davis's Godmother - a true hero. 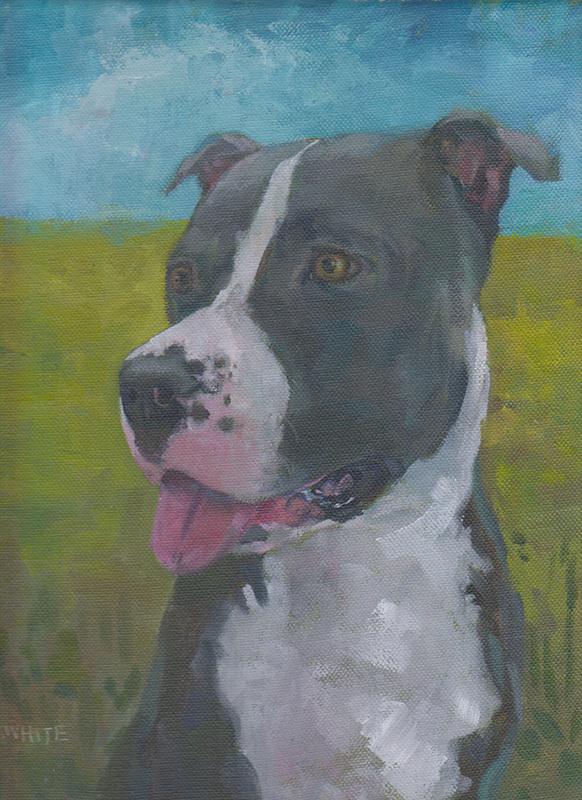 Brody, 8" x 10", acrylic on gessobord, July, 2014. This is sweet and playful Brody as a puppy. Her owner loves purple and this beautiful pose, lit from the side. I really enjoyed capturing his sweet eyes and furry ears. Molly is my friend and mentor's family dog. She is kind, strong and smart cocker spaniel and very loved by her family. Molly is 14 years young and remains graceful and youthful. 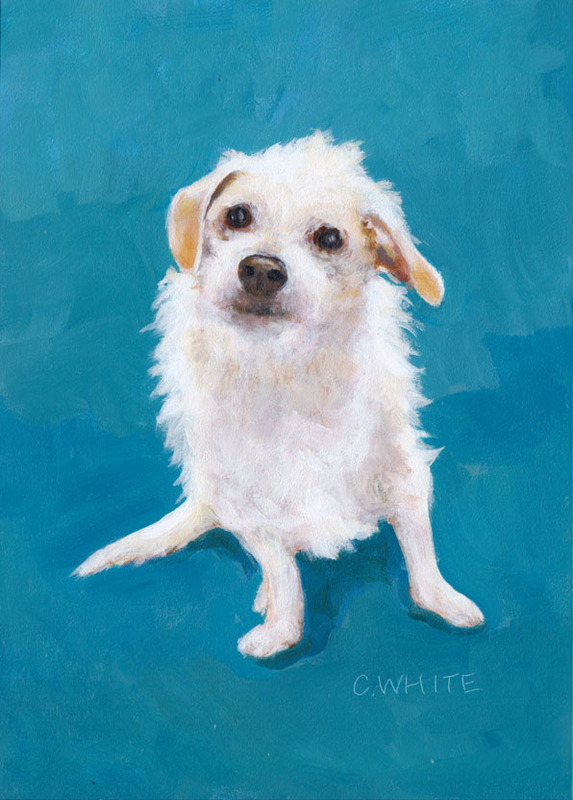 I have been planning a portrait of Gigi, my doggy sister, for years. 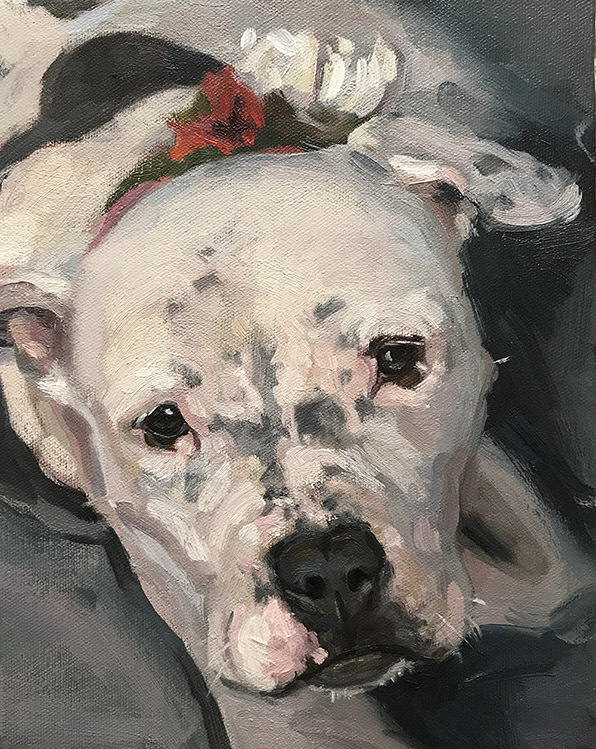 I have many sketches of her sweet expressions and knew it was time to create this piece when I saw clusters of gardenia on a walk in late Fall. Her father's favorite flower is gardenia and her mother wins the coveted best yard each season - thus, a garden setting was fitting for this beauty. 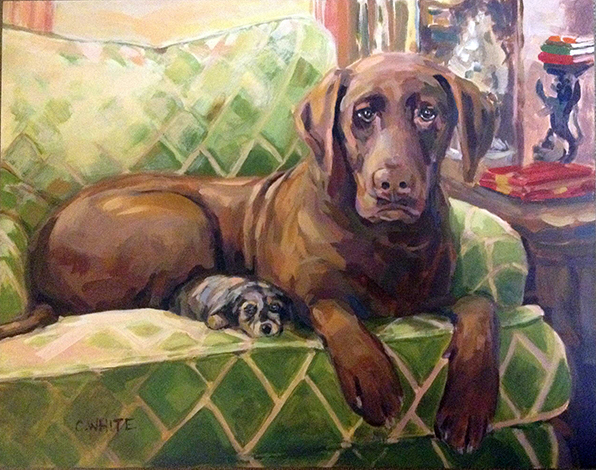 Our dear friend, Kari commissioned this portrait for her mom as a Christmas gift. I was thrilled to have the opportunity to paint Sebastian again. 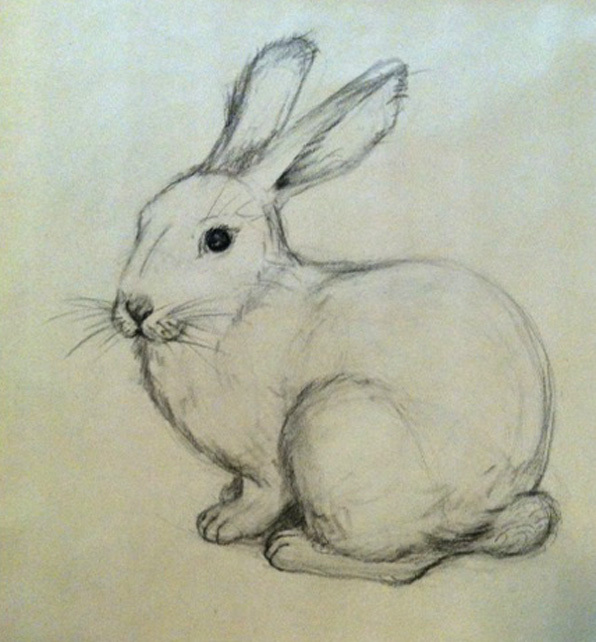 He is a great model who sits or lays beautifully for me to sketch him. 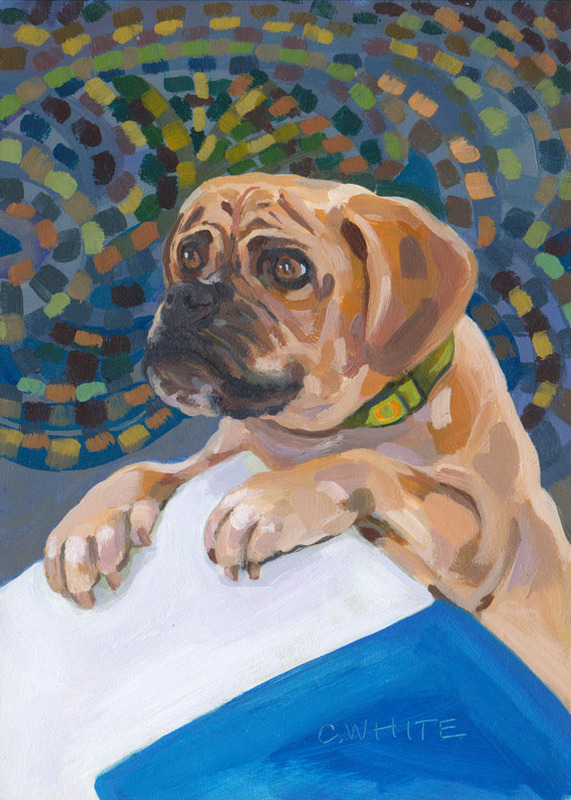 In this piece, he is at a restaurant along Rodeo Drive asking for his portion. Davis is an excellent model, always present and ready to please. 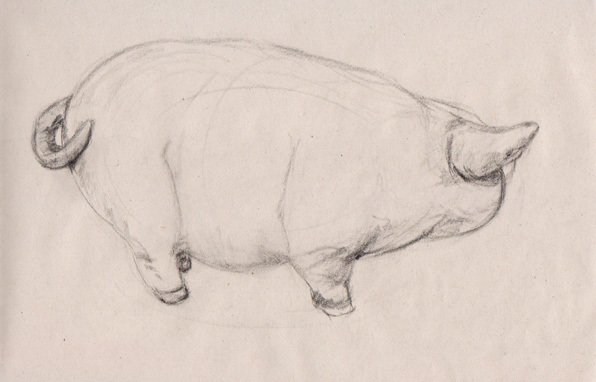 I especially enjoyed sketching him from different vantage points. I selected this pose since it is similar to one of the first painted sketches I made of Jack. I love how Davis's fur is growing in, soft and fuzzy like a baby chic. He surprises us everyday and we are so grateful that he chose us for his forever family. 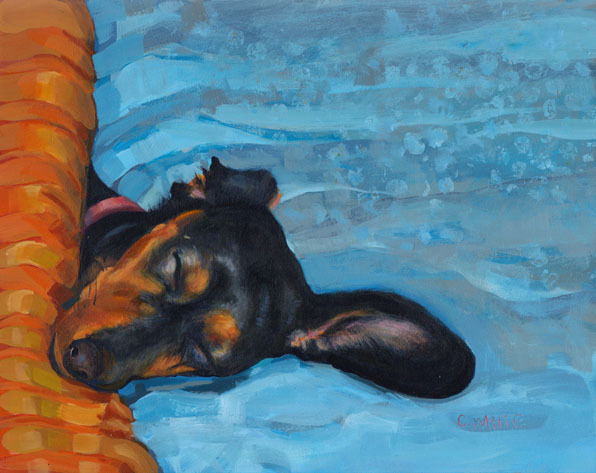 Our sweet neighbor friend, Vaya is a dreamy little dachshund floating on a cloud. I absolutely loved making this portrait! It was especially fun to paint the flesh of her ear and the light on her eyes. 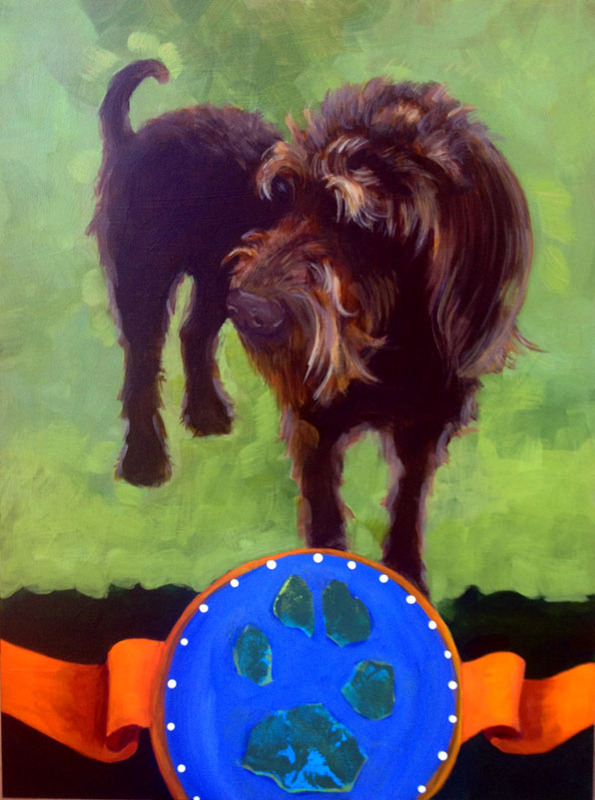 The complimentary color choices help to emphasize her silky and beautiful black coat. Splash is nestled in her owner's lap enjoying a restful afternoon. She has the sweetest expression of being happy and safe. 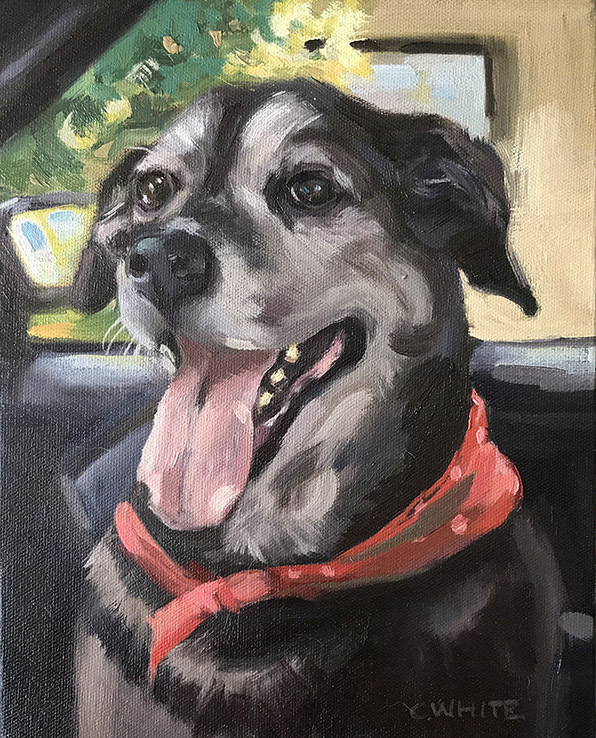 "Beautifully rendered, capturing not just our dog's appearance, but her personality in a way that made us all smile," stated my satisfied client upon receiving commissioned portrait. 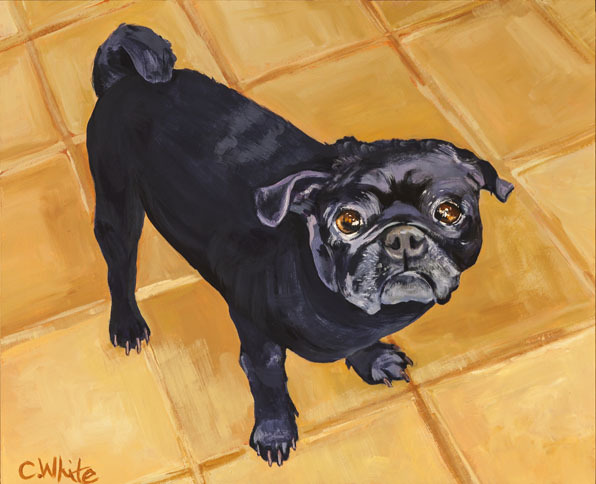 I painted this from a photo that I took when we first met Spike. Spike was sporting his flak jacket on that chilly afternoon and prancing around like a good boy. 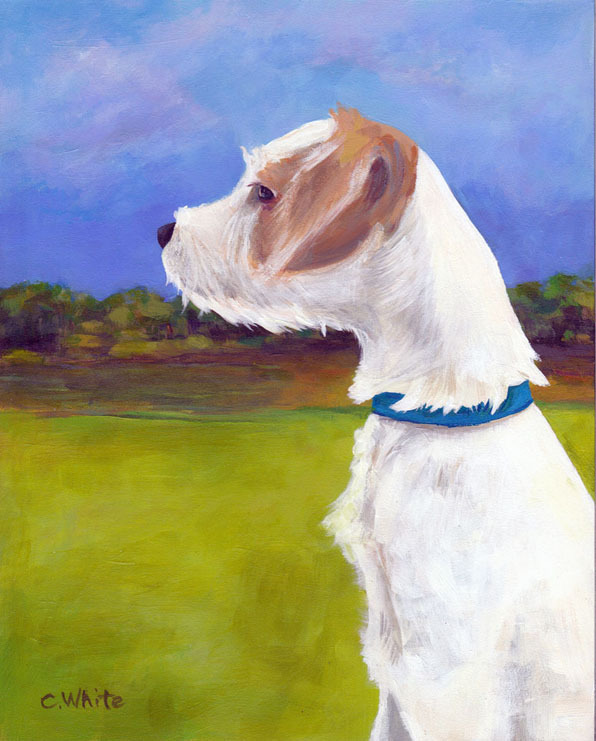 He is an all around sweet and charming dog who follows his Natalie and Shane off leash wherever they go. He works at a horse stable with Natalie ensuring that everyone has a good time. 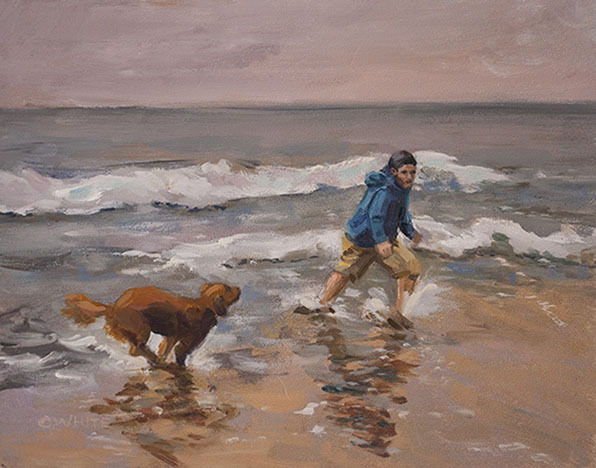 This most recent painting features two of my favorite friends in one of their favorite places. As long as Sunny and Star come along with their parents, Jordan and Gail, they are thrilled! I took this photo one afternoon after we all played on the Oregon coast together. 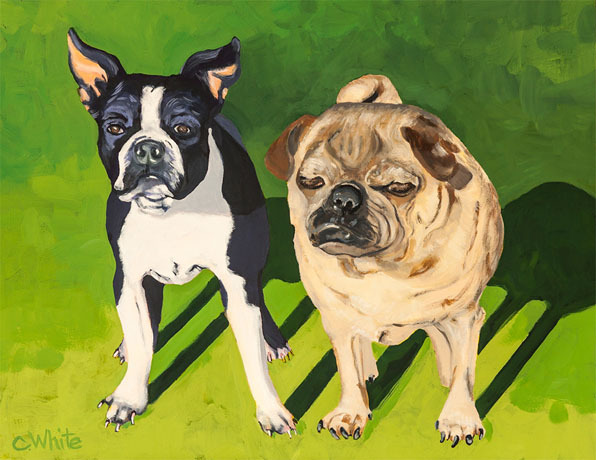 I am now featuring the 5" x 7" size for two pets! I can work in the size by including both pets from the shoulders. 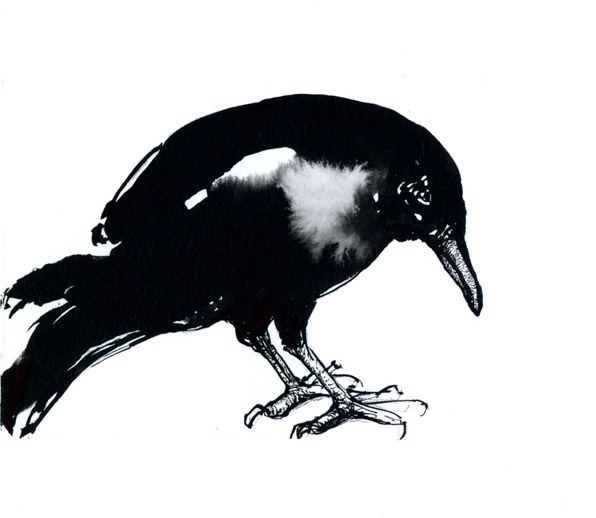 Please see my pricing page for this new addition! "Weezy" as she is affectionately known in the Hendry household is a phenomenal creature. 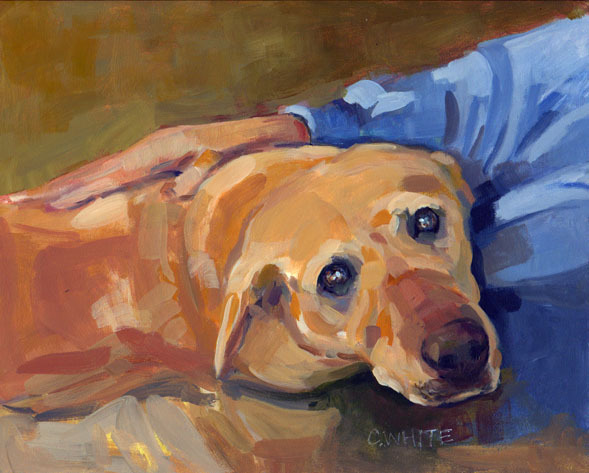 She is a fine example of dogs' ability to forgive and love unconditionally. Her sweet eyes will melt your heart. 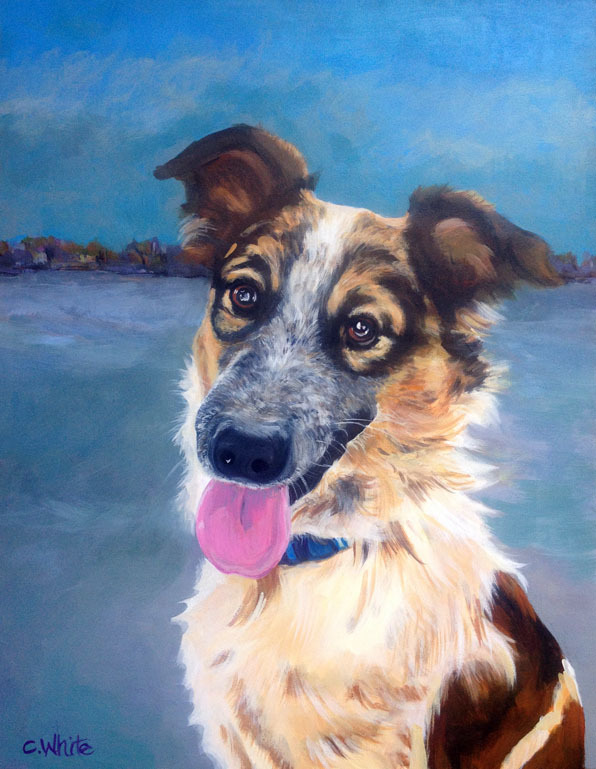 She is featured here on Hunting Island in South Carolina playing on the beach for the first time with her family - her forever home. 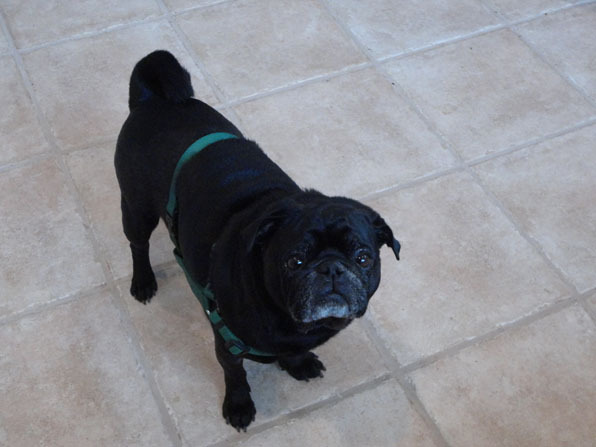 Bubbles is the epitome of pug - fun loving, sweet and very playful. I had fun trying to capture her personality. These two lovely ladies brought joy and laughs when they were with us on earth! Zoe, the little white one was sweet and playful. 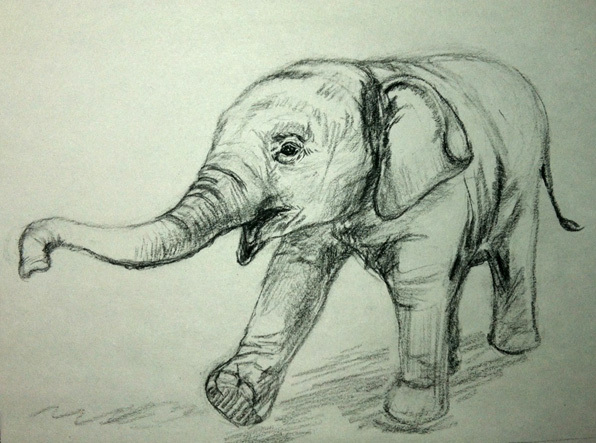 Ellie was strong and smart - just look at those wise eyes. secret while visiting the Hadley-Lisko house this summer. Belly was one of my best models! 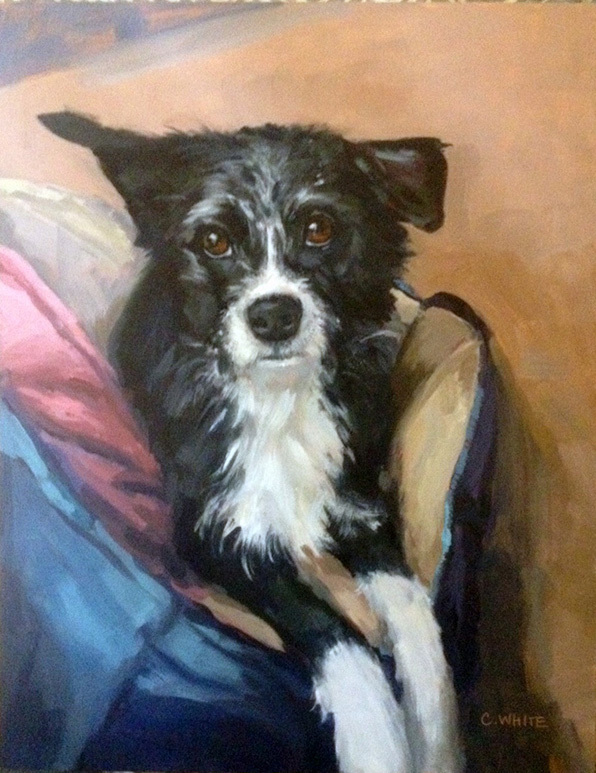 She is lovely and enjoyed relaxing on my lap while I painted her portrait. She did not even mind when I needed her to sit back in position or look up at me so that I could try to capture her lovely spirit in those great eyes, thank you Belly and Belly's awesome family! 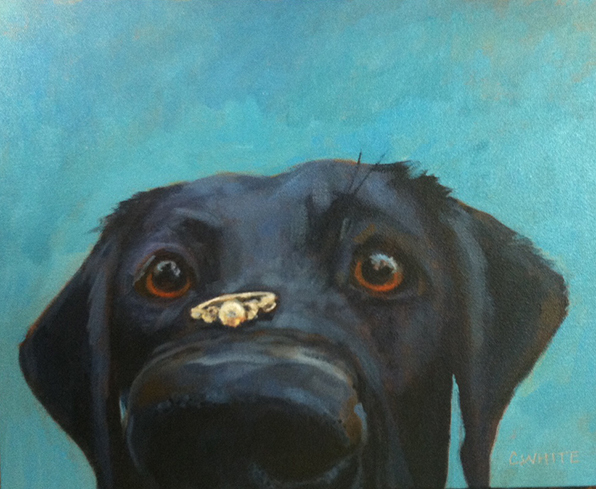 This was a present commissioned for a wedding gift. 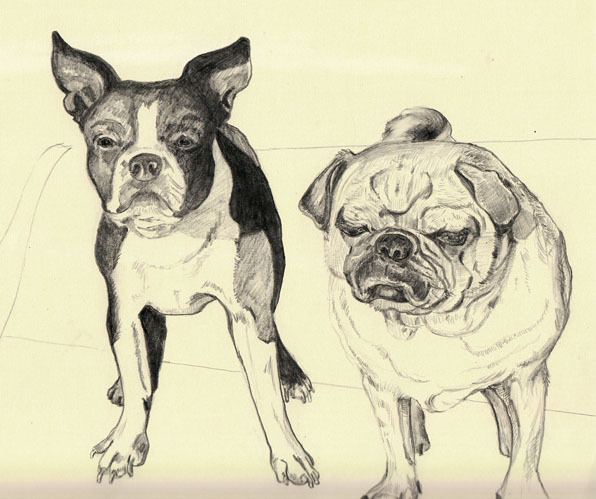 The dogs belong to the Simersons. Pokey embodies all that is catness and she is lovely to look at and touch. Biscuit is Jack's cousin. Biscuit is a very sweet and courteous dog. 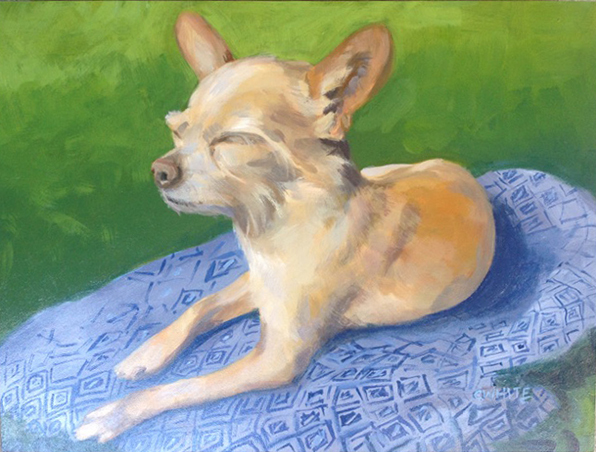 focus on Blues' relaxed and regal pose while soaking up the sun and thus, seeming to glow. enjoyed taking long walks in the meadow featured. After Jack's afternoon nap, he yawns, stretches and gives me this sweet glance. 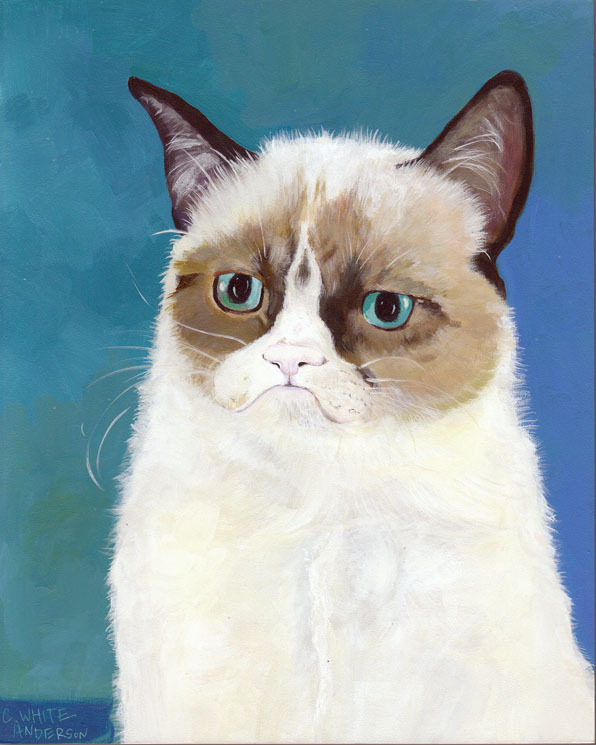 The artist reserves the right to use copies of commissioned work for her own portfolio and promotional purposes. All work is copyright of the artist. 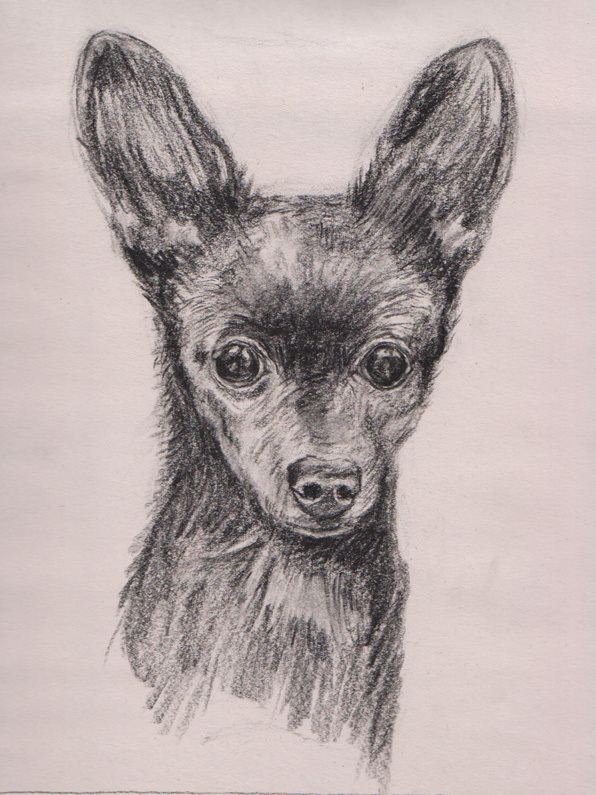 For 2013, I just added the 'fun' size, 5" x 5" for one pet portrait for an up close painted sketch $125 plus shipping! 3. Your choice of canvas/panel for your one of a kind portrait. 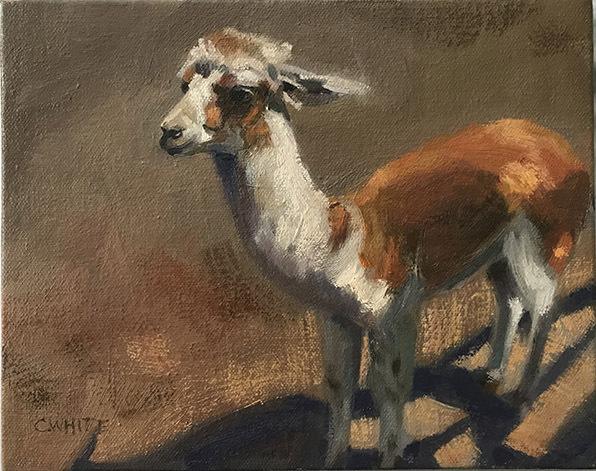 If you would like to gift a painting to someone, we can arrange for me to work with the recipient to make sure the painting is exactly to their liking and you may purchase a Gift Certificate. 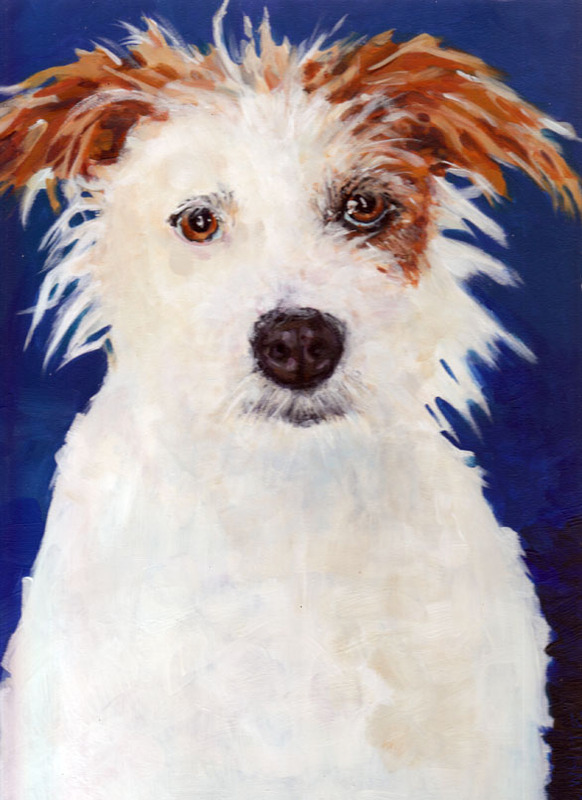 Due to the nature of painting, drying and varnishing, please allow a minimum of 4-6 weeks plus shipping time for your portrait. 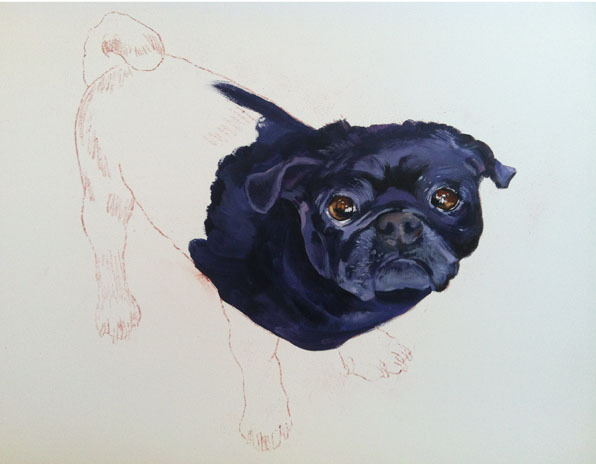 We will discuss your interest in commissioning an original pet portrait along with your pet(s) in detail, your ideas, timeline, budget and anything else relevant. I will email my questionnaire and contract for your review. 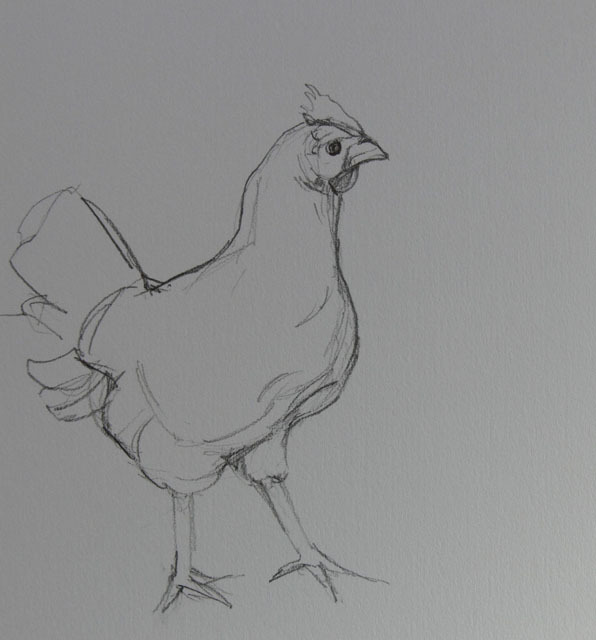 I create sketches and email them to you for discussion and final approval. 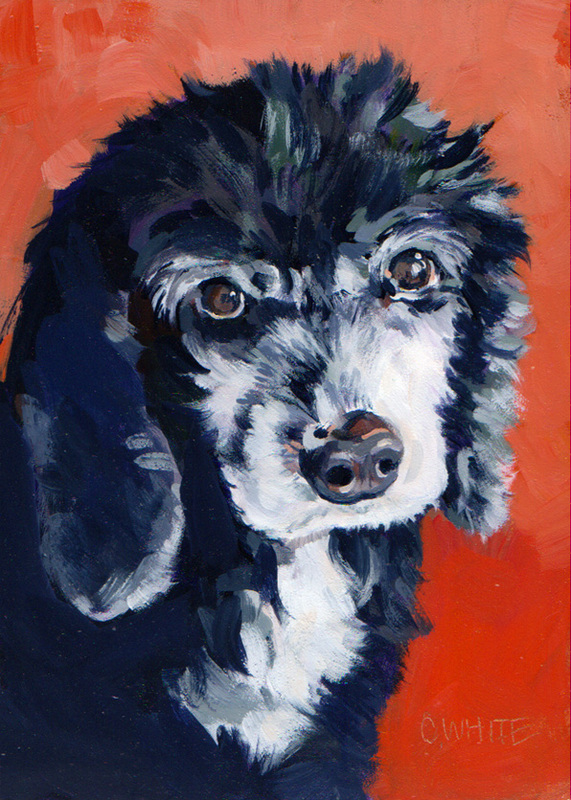 I paint your one of a kind portrait(s), communicating with you along the way. I will email a ‘ final’ version for approval. Once approved, the painting needs at least a week to dry (depending on humidity). Once the painting is dry, I will varnish it, using Gamblin’s Gamvar UV protect varnish. The varnish will take months to fully cure, however, it is possible to ship and display after one week of varnishing. 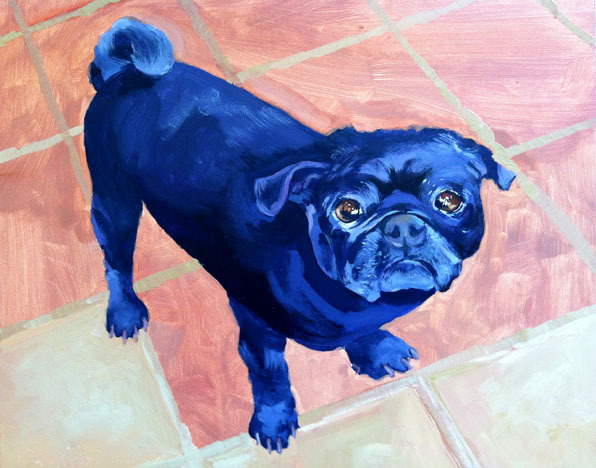 Once the portrait(s) is ready, I ship it to the recipient or delivery in person may be available. You receive the portrait(s) and send me the remaining balance. I paint on eco - friendly canvas more often now than panels. Part of Ampersand's Museum Series featuring Archiva-Seal™ technology, an advanced formula for sealing wood that ensures your artwork created on an Ampersand wood panel will remain acid free over time. All Ampersand Museum Series painting grounds are archival, acid-free and non-yellowing. Ampersand is committed to producing products that don't harm the environment or the artists who use them. All Museum Series Panels are made using FSC certified forest products. The FSC certification is one of the most effective standards for protecting wildlife, plants, soil and water resources. Ampersand's Museum Series boards are formaldehyde-free and do not contain any organic compounds that generate harmful gas emissions (VOCs). 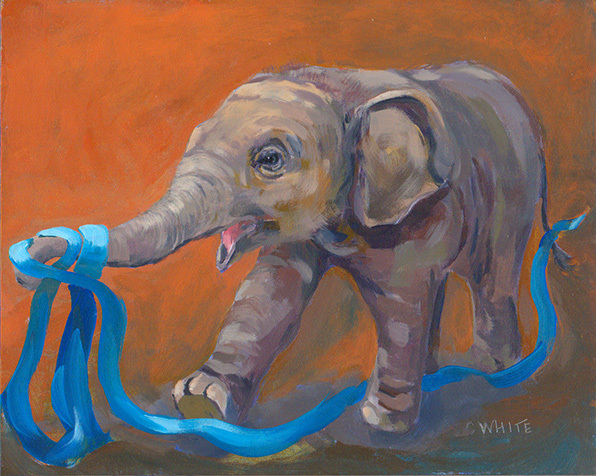 Playful Baby Elephant with Ribbon, 8" x 10", acrylic on gessobord, December 2014. 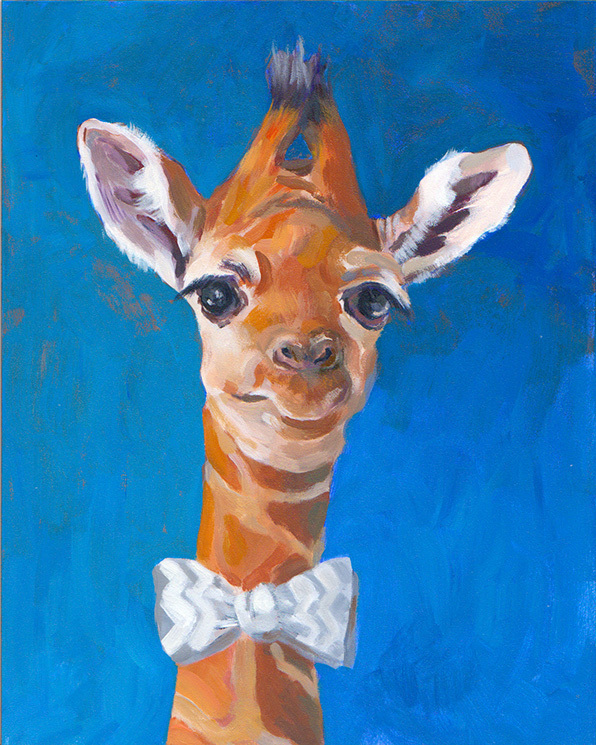 Silly Baby Giraffe with Chevron Bowtie, 8" x 10", acrylic on gessobord, December 2014. 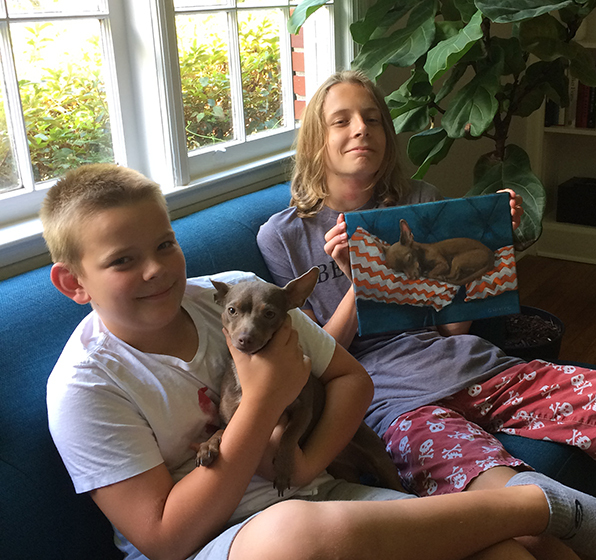 Hensley Boys with little Bonnie and her portrait, June 2017. 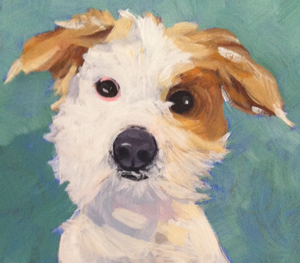 "I never dreamed my daughter, Kari would commission a painting of my little buddy for me! 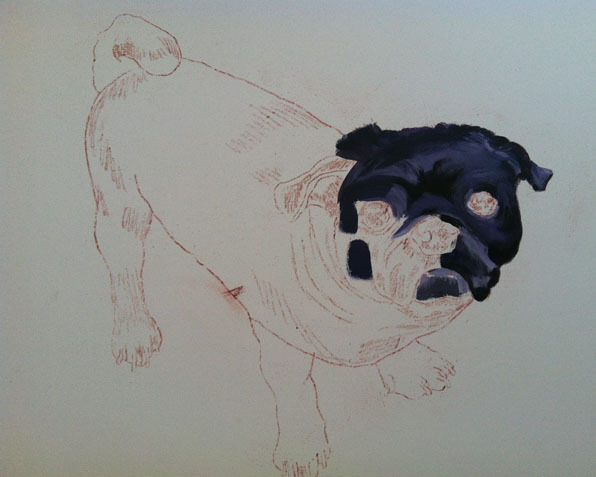 Cynthia, you not only captured Sebastian’s markings and his wrinkly little face but his personality as well. I am embarrassed to say that this is him whenever we sit for a meal. I don’t get to see Sebastian for long periods of time so having this beautiful portrait makes missing him a little easier. 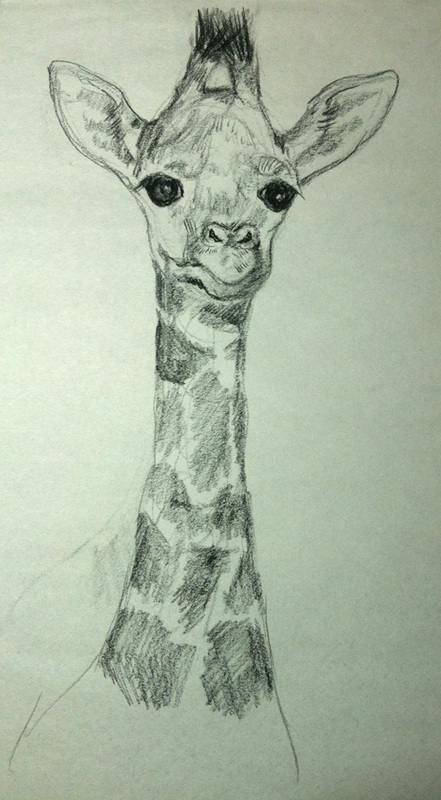 I will treasure his portrait forever. Thank you for the love you put into this work of art. My love and gratitude always", Shelley Stewart, December 2013. 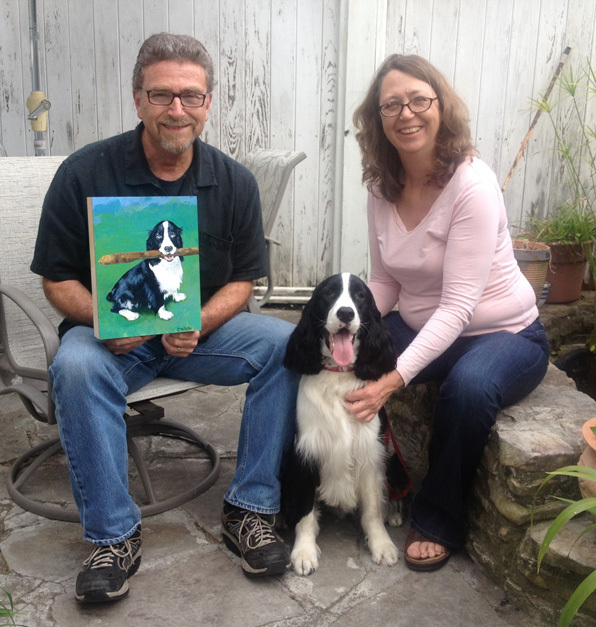 Louise is sitting on Coran's lap, while Walker holds the painting of Louise. 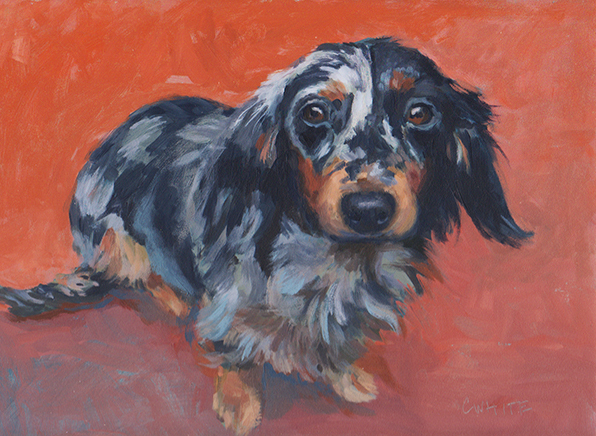 "Cynthia's painting captures Louise, especially her beautiful comical and sometimes haunting eyes. 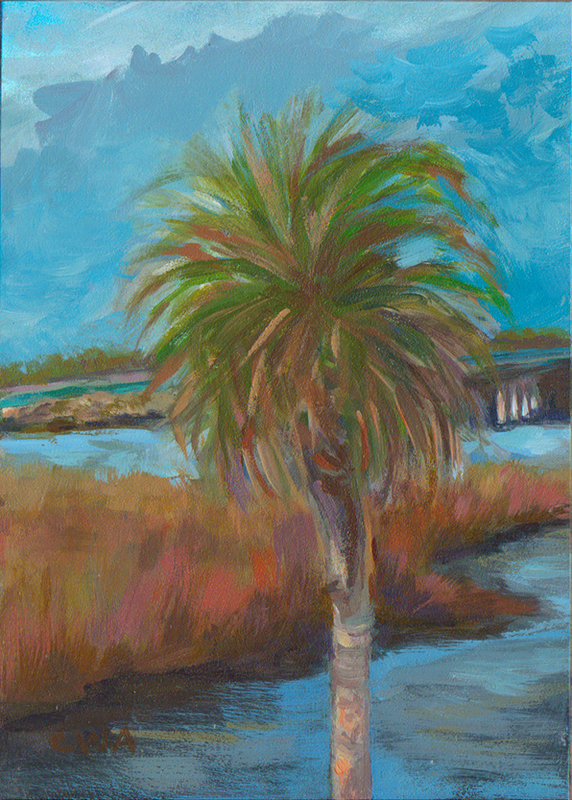 The background in the painting is from Hunting Island, S.C., a State Park where we had one of our first outings after our fateful meeting. 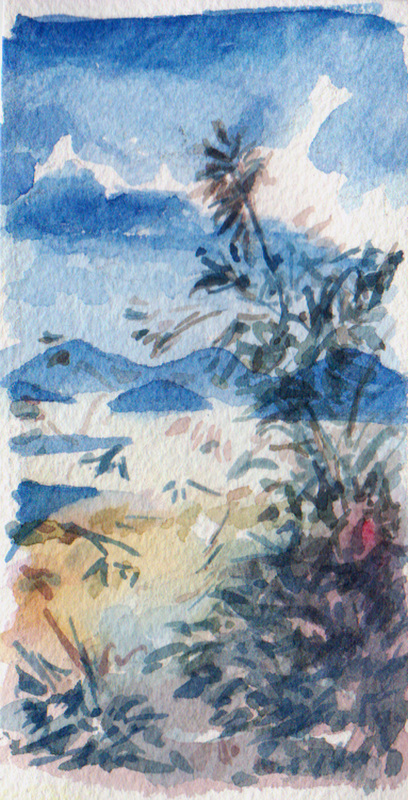 We watched with joy as Louise ran and played off leash along the edge of the water. Louise and I met in Forsyth Park in Savannah, GA on 10-10-10. A couple had a sign that read 'free puppies'. Louise was in a crate and her sister Thelma was running around. Several people were admiring Thelma. There was something in Louise I was drawn to, those sad eyes... I sat down on the grass and and her rescuers opened the crate door and she sat in my lap and nudged me with her nose. The couple looked down and his wife said, "Look!" And, that was it! Louise had found a home. I received the painting as a Christmas gift from my family. It's just perfect, what a great gift!" Charlie is special, one of those dogs that oozes 'dogness'. 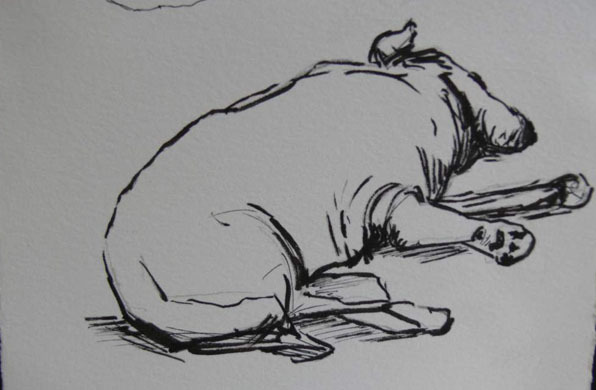 That certain something that dogs just know, it's in the wag of the tail that fills you with joy - immediately. And then, his soft fur, his sweet eyes just make you melt. 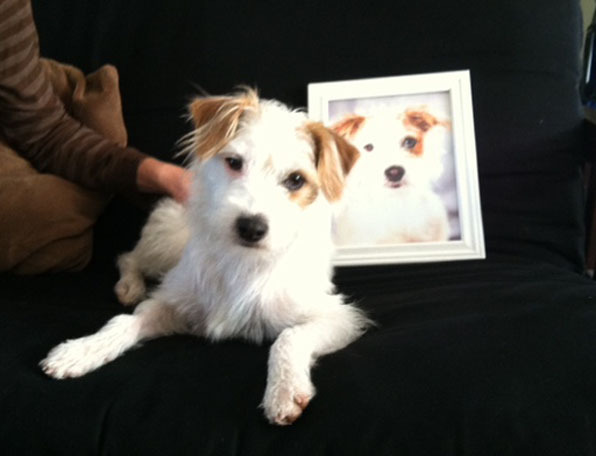 I first saw Charlie in the photos sent by Stephen, shown below. I nicknamed him "feather pants" since he has that wispy fur on his ears, legs and tail. 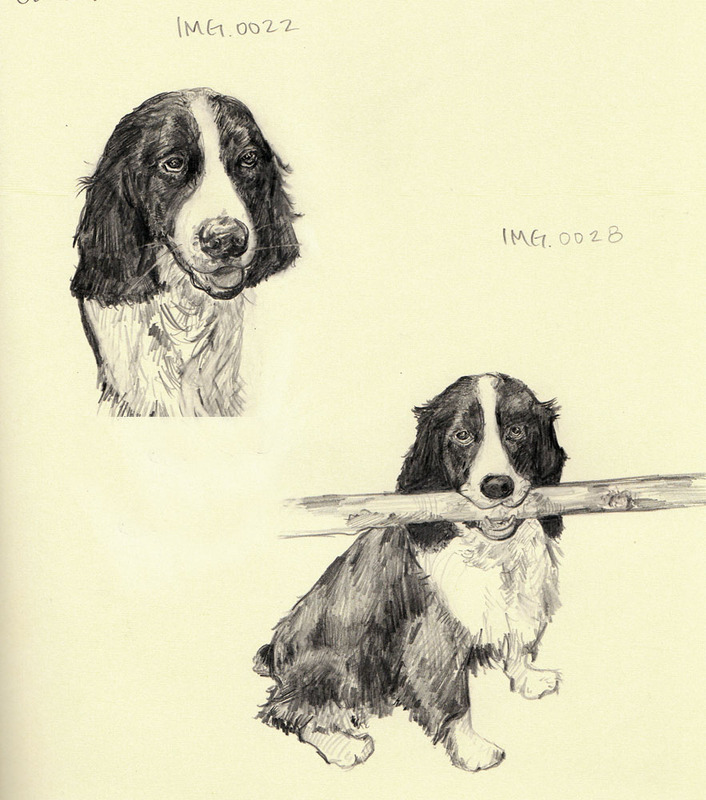 Below are the two sketches of Charlie from photo references. 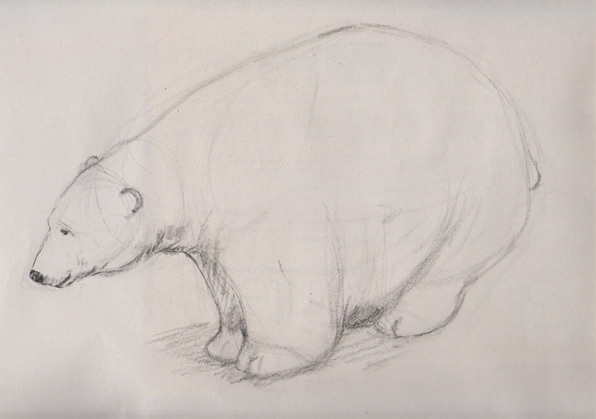 I submitted these sketches via email to Stephen for approval. We discussed how Charlie loves to carry his favorite stick of the day home with him and leave it at the door. 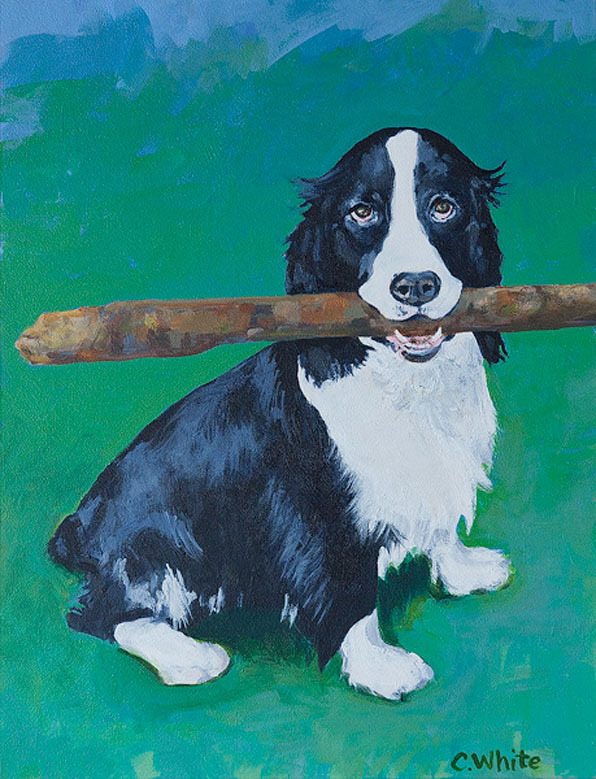 Often, when you see Charlie, you see Charlie and his stick. 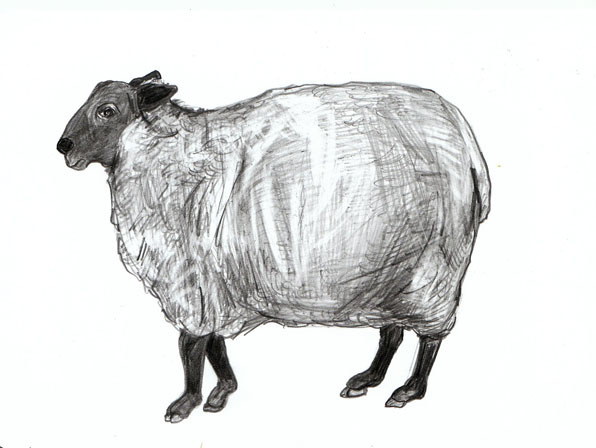 Thus, the choice for the final portrait. 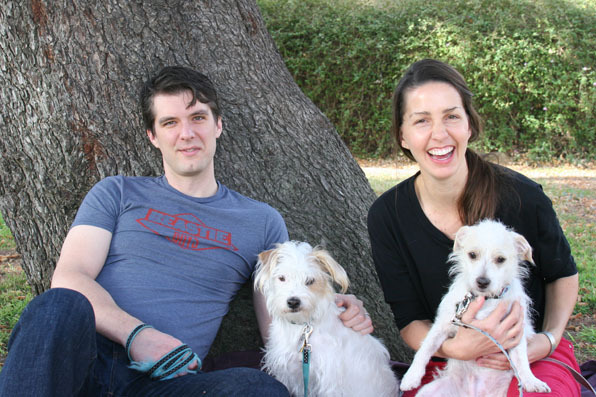 My amazing best friend and husband, Pyar, Jack, Davis and me, Christmas 2013.
Who Rescued Who? Pyar found Jack on the interstate in rural Tennessee during our cross country hike on 5/2012 and we have been in love ever since. Pyar found Davis running across six lanes of heavy traffic in our neighborhood on 8/2013 and we have been in awe and giggles ever since. My mom allowed me to draw on my bedroom walls. I used to decorate and clean my turtle's grave site. 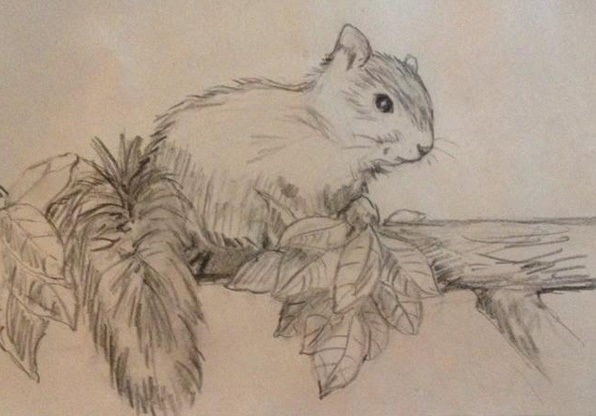 When I was bored visiting a relative's house, I would paint and draw to occupy my time. 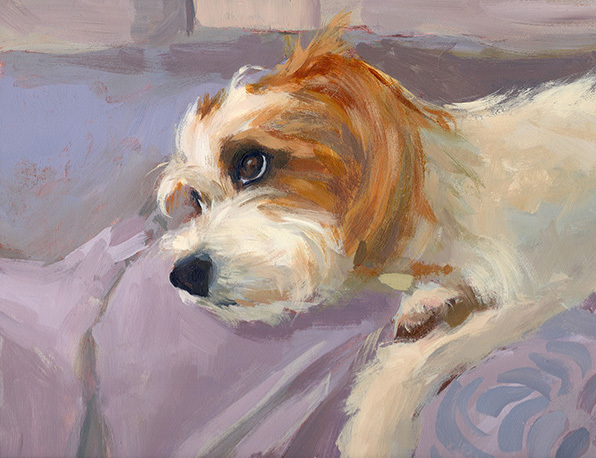 My first dog, Cinnamon would let me put hats on her head and pretend we lived in Paris, making a living from the sales of my paintings. 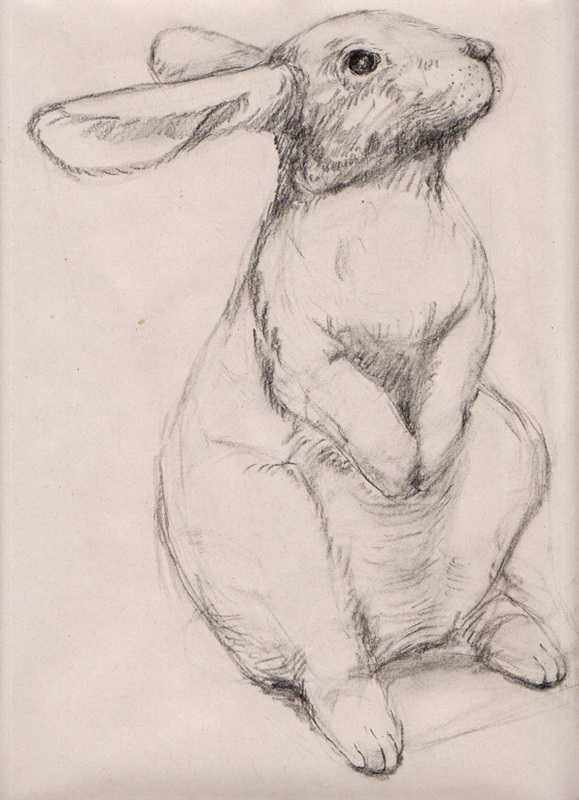 In college, I studied under artist and teacher, Susan Myers. 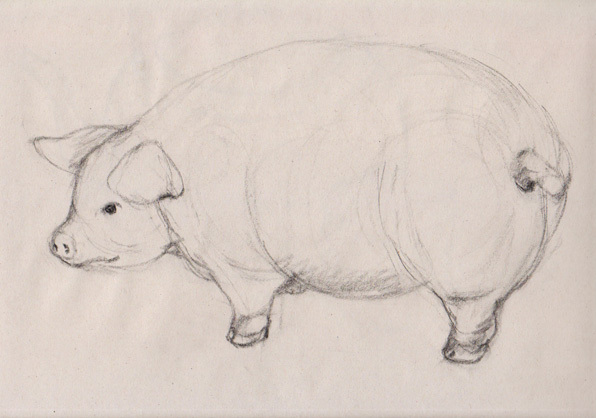 She played a pivotal role in guiding me towards life as an artist. 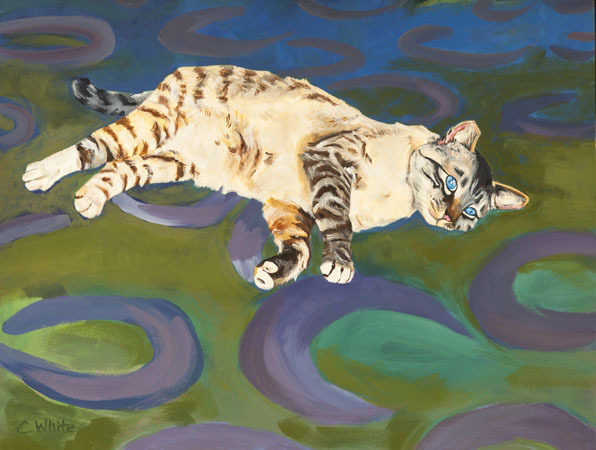 I later became her studio assistant and learned to paint under her tutelage. After earning my M.F.A. 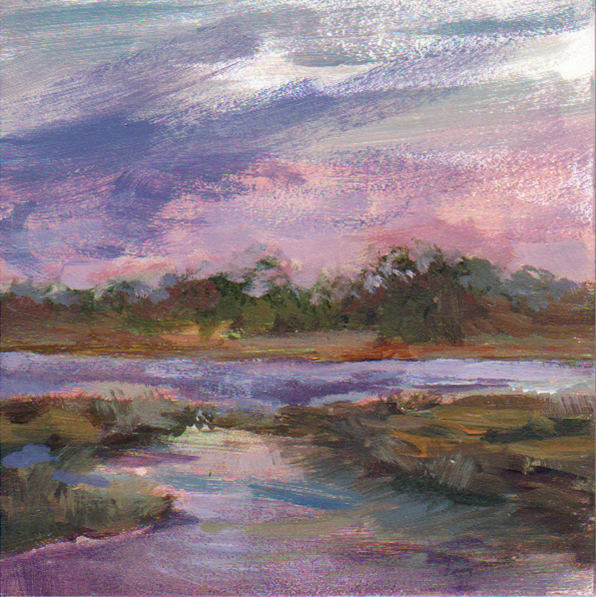 in painting at the Savannah College of Art and Design, I planned to complete a certificate in Art Therapy. 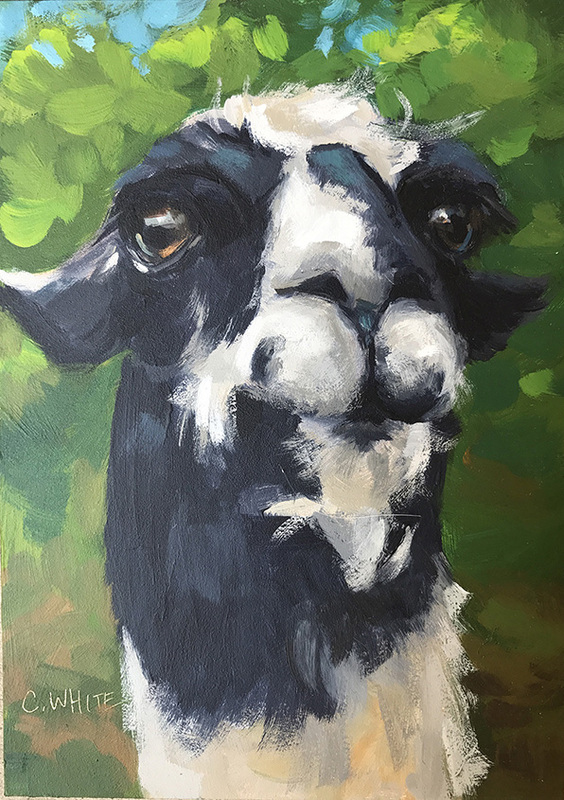 Working toward that end goal, I volunteered as an artist with Hospice Savannah and shadowed art therapists to determine if more schooling was the best decision for my interests. During that time of discovery, I also worked in after school programs for latch key children, helped to build an art education program in underprivileged schools, assisted in creating a mural with thirty sixth graders in Japan, cleaned up garbage on the streets of Thailand with local school children, skied the Alps in Austria, danced with children in Haiti, gleaned fields in South Carolina and was a foster parent to dogs and cats in Japan and America. Since then, the Anderson family has been an incredible support for creating my portfolio and thus launching this site. With continued support from family and friends, I now get to paint in my pajamas. 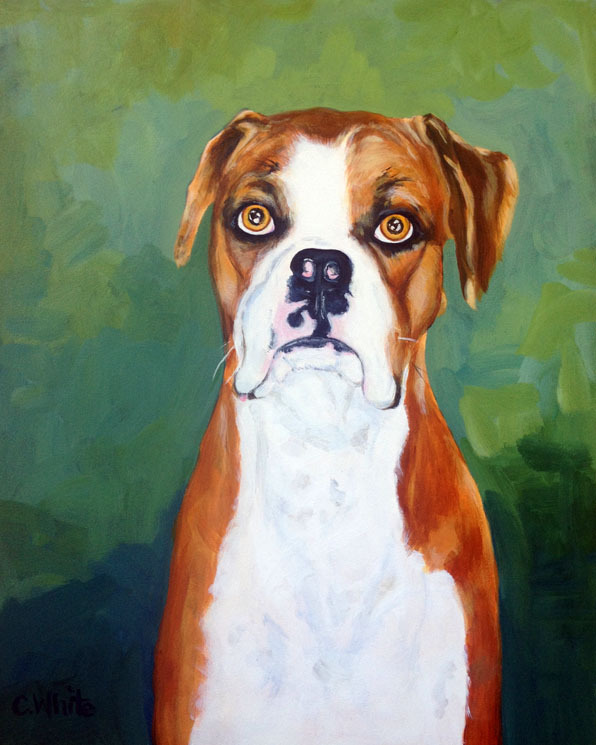 Kittypuppytown.com is the custom pet portrait business of artist and animal enthusiast, Cynthia White Anderson. 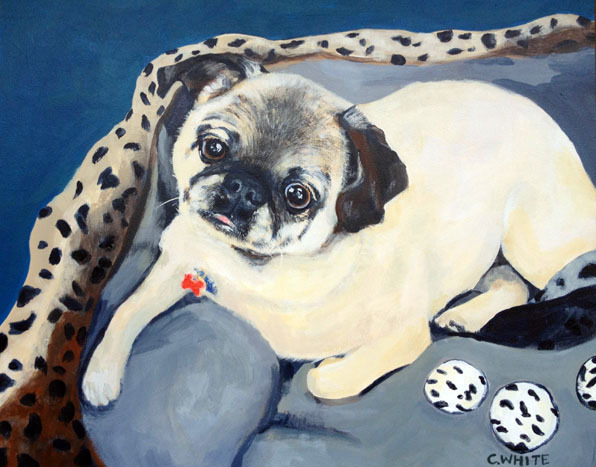 Cynthia lovingly paints her portraits by combining the wants of a client along with her unique artistic vision to honor and commemorate a loved one through a timeless piece of fine art. 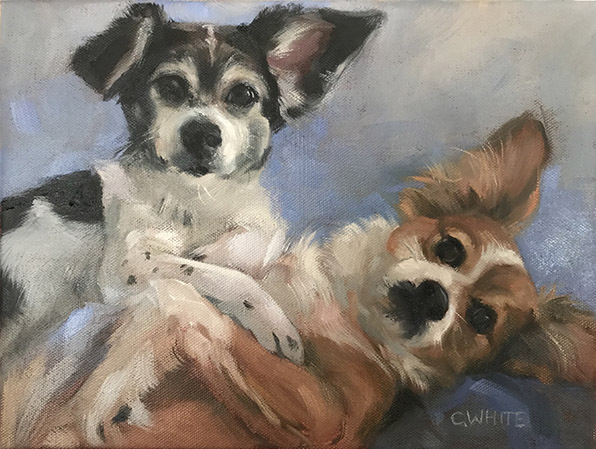 Guided by love and inspiration, Cynthia's art depicts the spirit, personality and beauty of your beloved best friend(s) while contributing to our universal reception for increased awareness and respectful treatment of all animals. 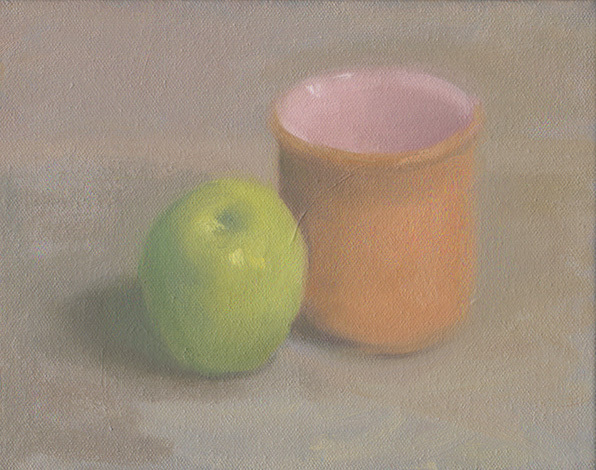 My second color still life painting using an American palette, December 2014. 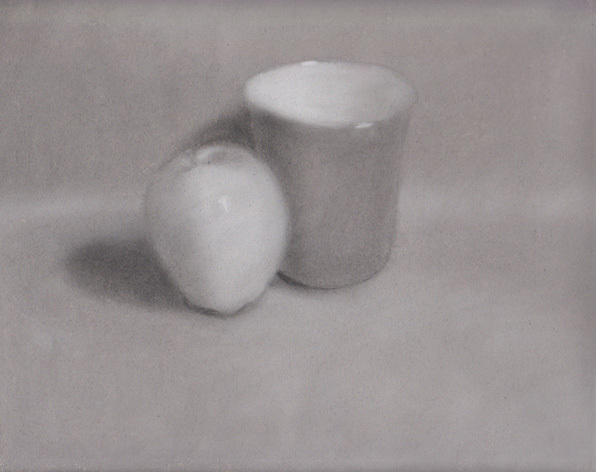 My first color still life painting using an American palette, December 2014. 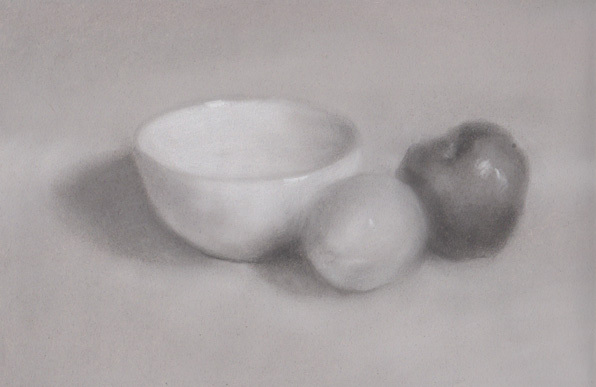 My first color still life painting using a European palette, December 2014. 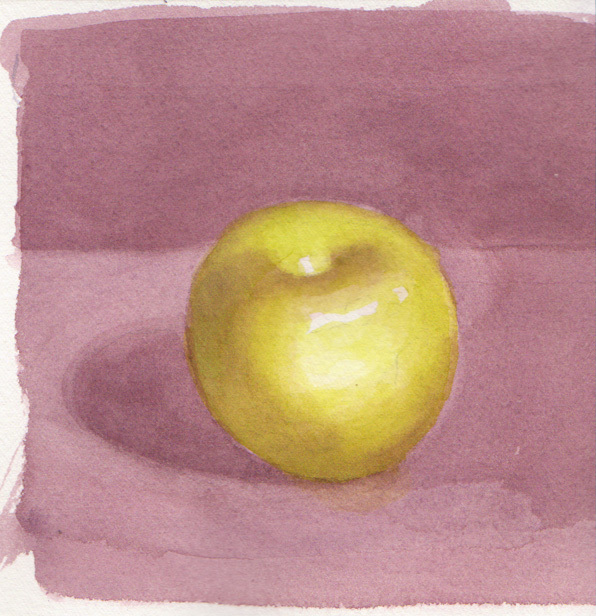 My first color still life apple study using an American palette, December 2014. 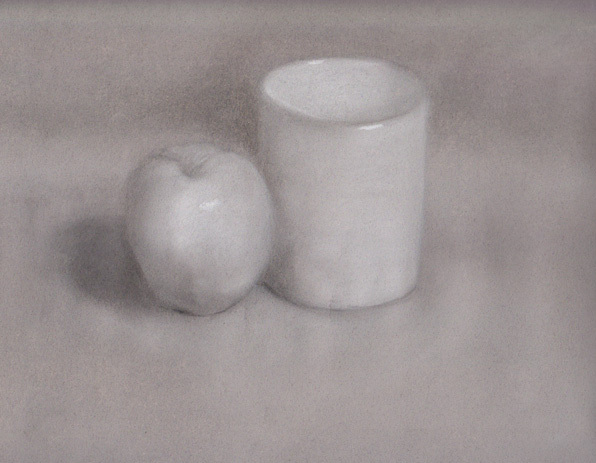 This is from a side by side demo with my instructor. I will then teach the method with a student using the same techniques. 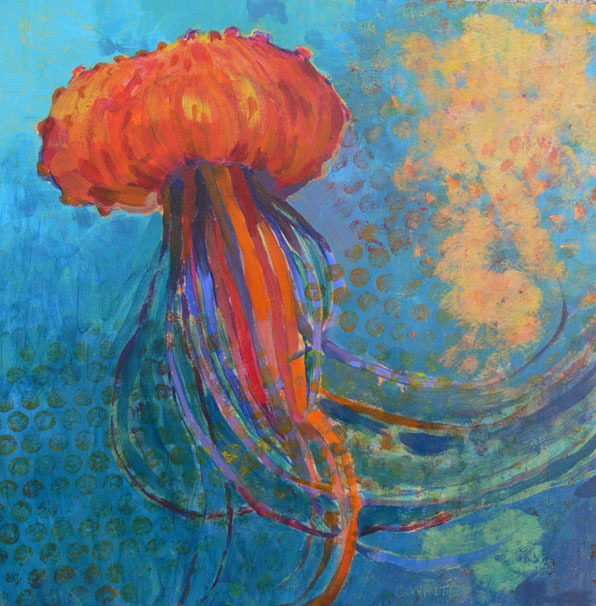 Client requested a mural to remember the beauty from her time living in Playa Del Rey, California. 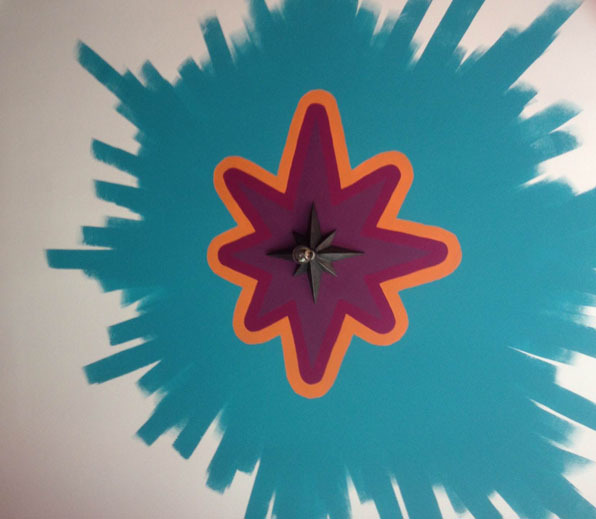 Client requested a colorful burst radiating from existing ceiling fixture, selected colors complimented the room. Can you paint from my photographs? Definitely! 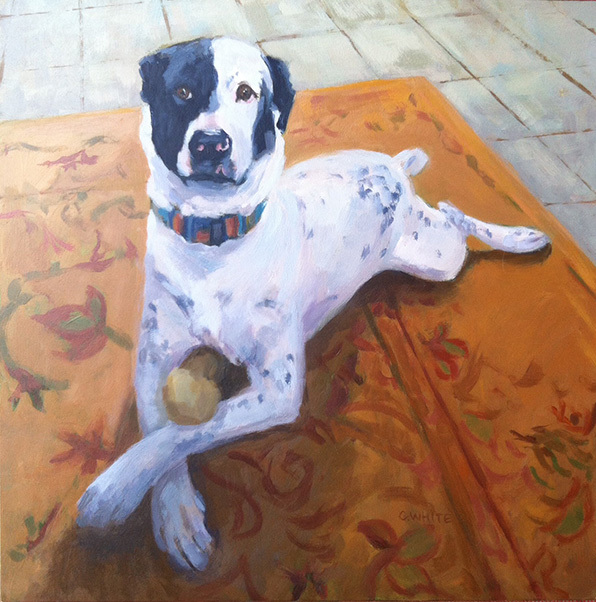 It is my preference to meet with you and your pet(s) in person for a commission. However, that may not always be possible. 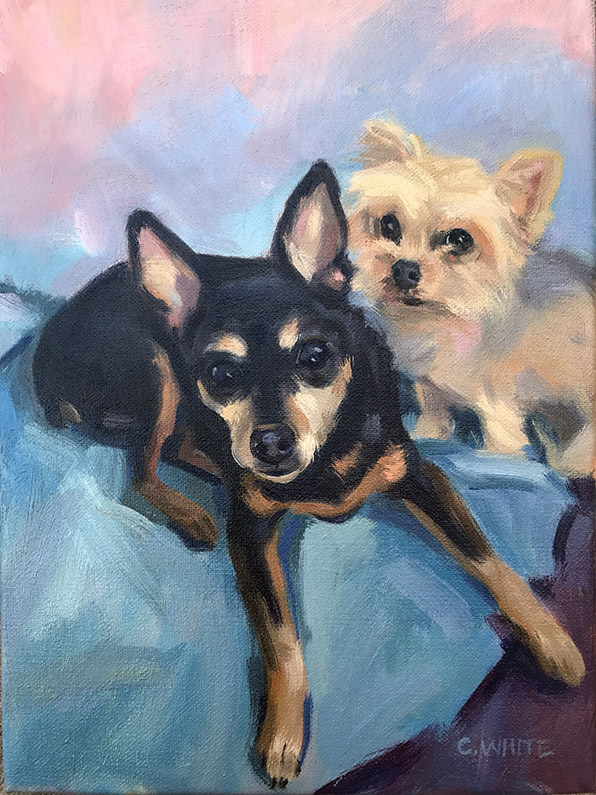 I can work from your photographs and a discussion about your pet(s) personality and lifestyle to best understand your furry or feathered friend. I'm not sure what picture to choose for the portrait, can you help me decide? 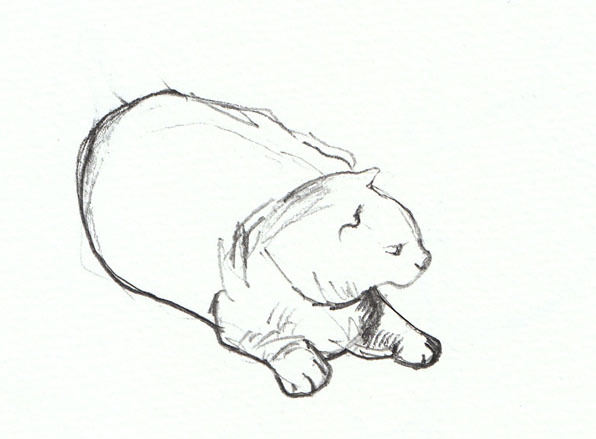 I like to work from several photographs in order to best understand the pet(s) body type and features. 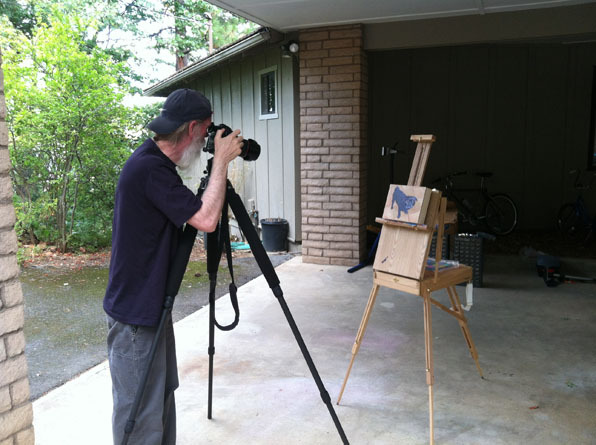 I usually ask for several photos to begin the commission process. I don't have any clear photos and my pet has died, can you work from old, faded photos? 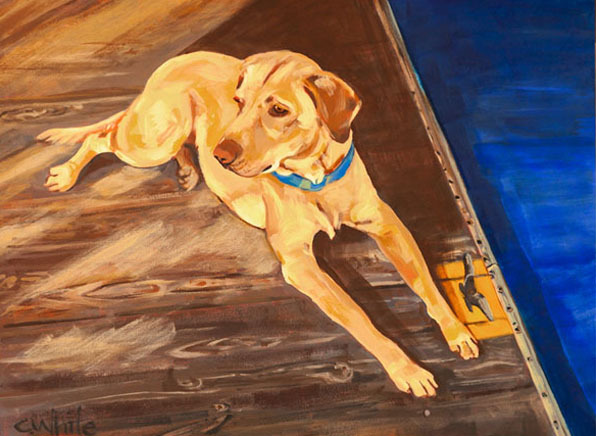 Depicting a pet who has passed is one of my favorite aspects about pet portraits. 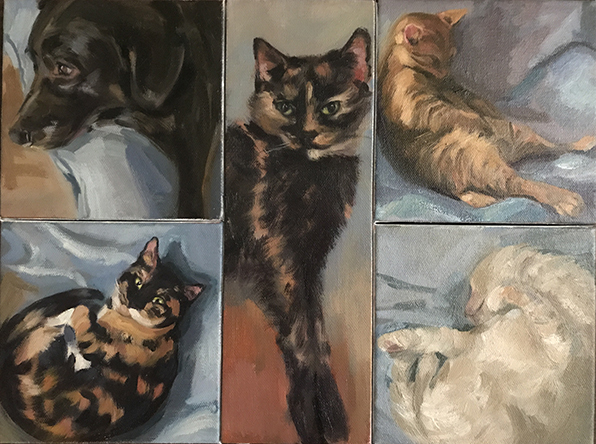 I think it is important to have a keepsake of our friends, and a painting can do just that when there aren't quite enough photographs. 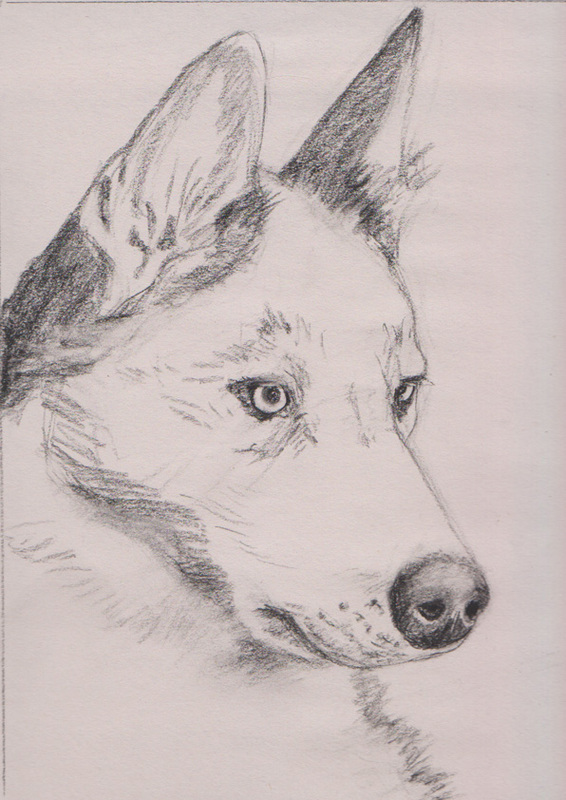 Sometimes old and faded photographs don't give enough detailed information, however with a discussion regarding your pet(s) personality and several images, I can work up a few sketches and we decide from that point what you have in mind exactly. 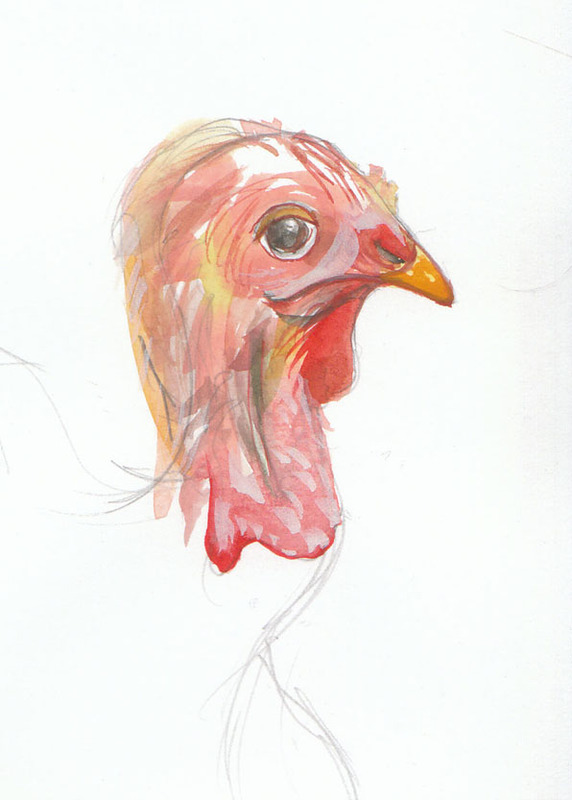 How does the process work when I want to give the painting as a gift? Gift certificates are available if you wish to give the gift and have me work directly with the recipient. 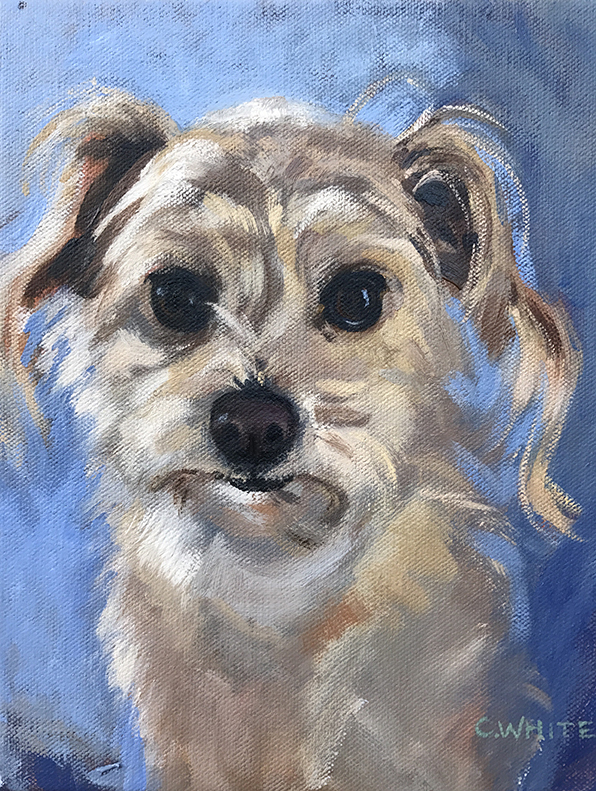 It is also possible for you to email me photos of the pet(s) and we can discuss the recipients likes and create a one of a kind painting as the gift. Please email me with any further inquiries and include your telephone number so that we may talk by phone.